Way back in the mists of time games workshop released a small little game called Necromunda, maybe you've heard of it? The idea of gang wars in these massive hive cities immediately caught my attention and the vast diversity of gangs, bounty hunters, mutants and general lowlife scum opened the world up to all kinds of crazy and innovative ideas. 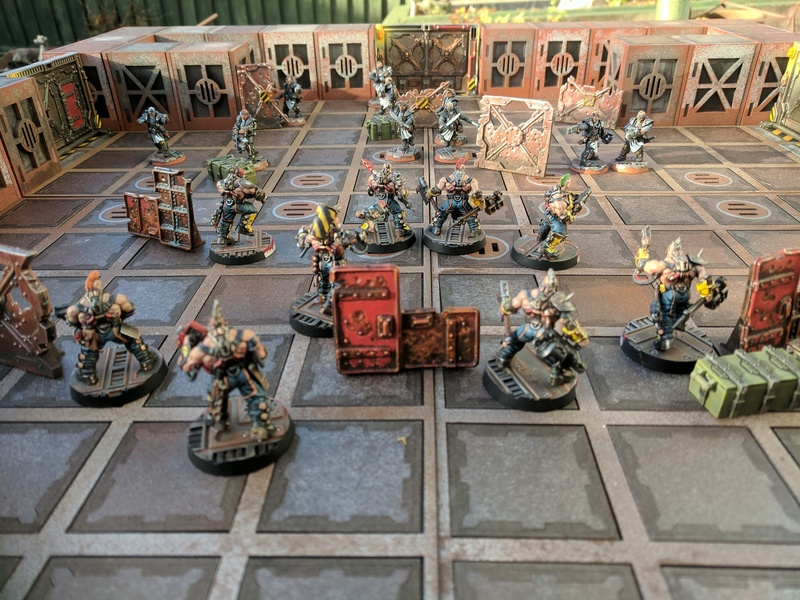 After 2 decades of waiting GW finally release Necromunda again, but unlike its original release the initial box set was missing the cardboard and plastic 3D terrain and instead focused on a 2D warzone. Necromunda to me should be played in a 3D space so I started this project to try and create a modular terrain system to offer the choice of making maps from the underhive and to also allow customisation to build upwards and outwards to create something unique. 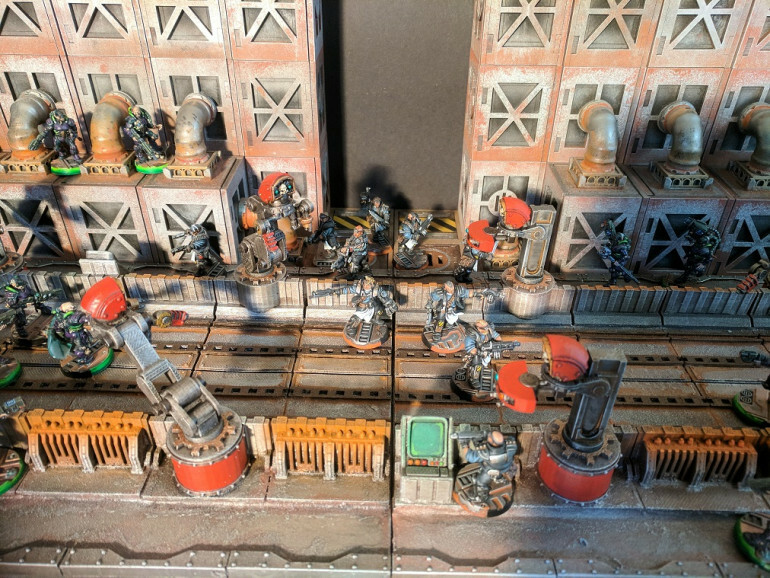 Aim for the Red ones! 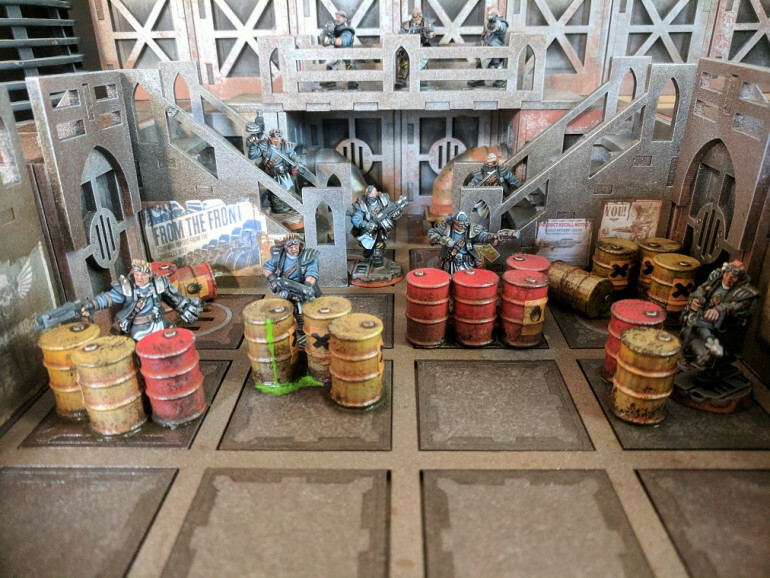 If video games have taught me anything, barrels and crates should be EVERYWHERE! 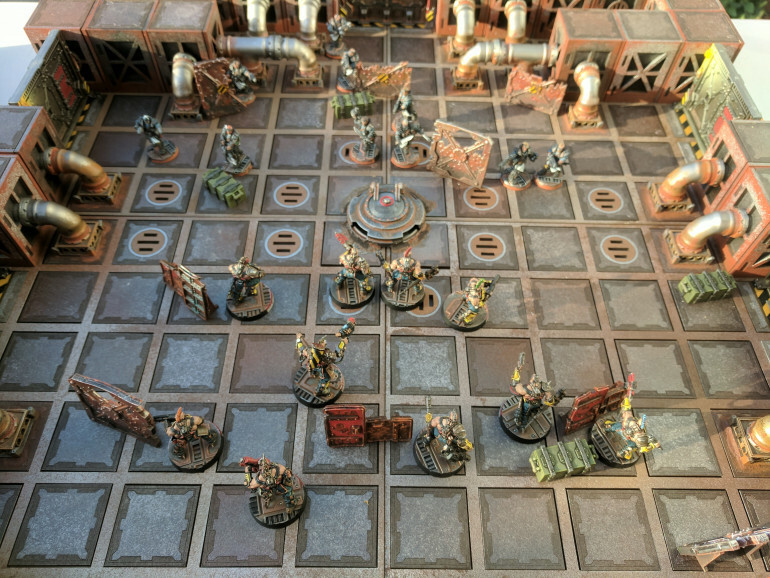 and this should be even more true in a hive city. 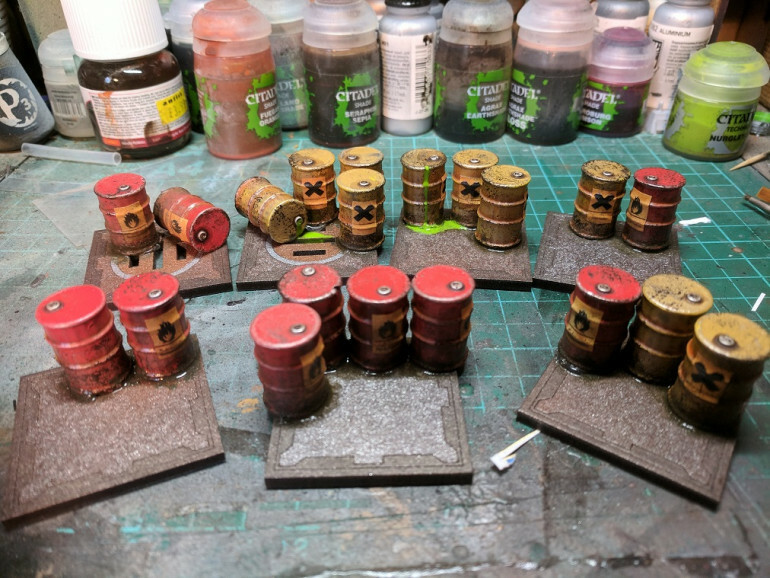 I wanted a good handful of oil drums to group together and place next to barricades to add in an extra level of detail and realism. 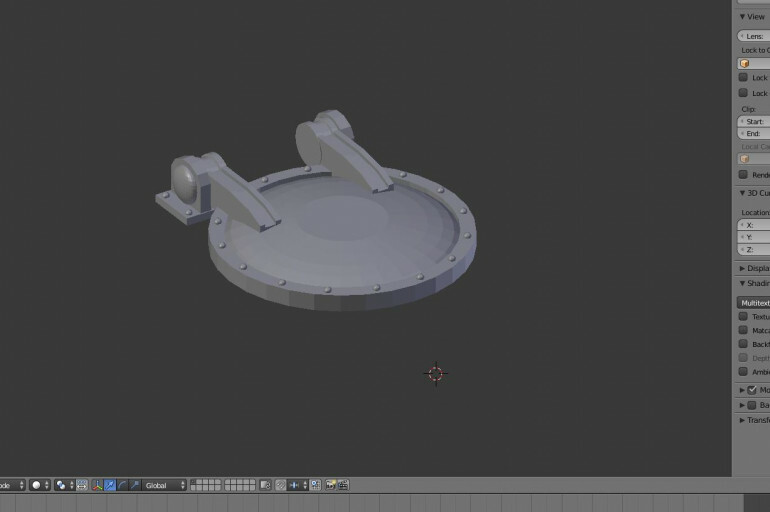 I put together a simple oil drum shape in Blender and printed it off on my 3D printer, once i was happy with the size i made a rubber mould so i could run off as many copies as i like. I wanted a bit of variation so I did 20 barrels and painted 10 yellow and 10 red, the base coat for the yellow was more of a brown ochre spray paint while the red was just a standard hot red, The base coat was followed by a wash of agrax earthshade and/or strong tone from army painter and then finally drybrushed. 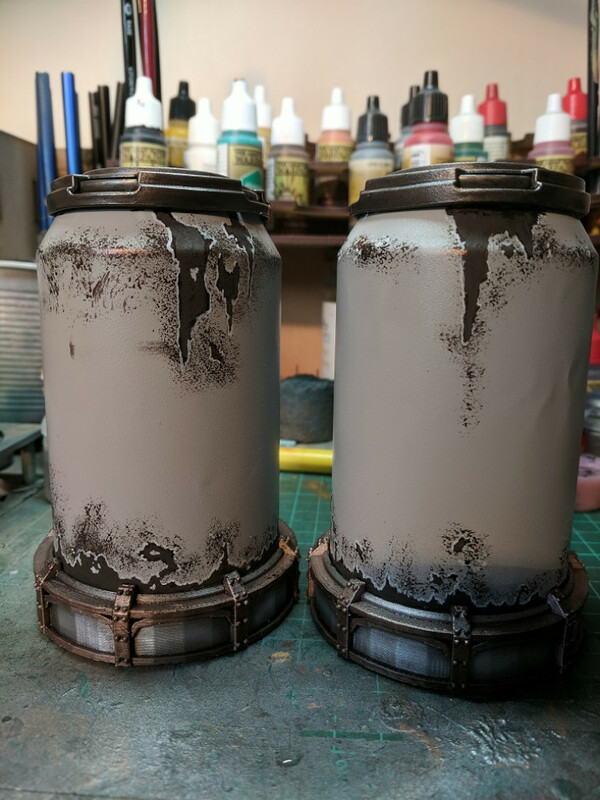 To weather them a little more i did a light drybrush of light silver just to give the impression of paint fading/chipping in places. 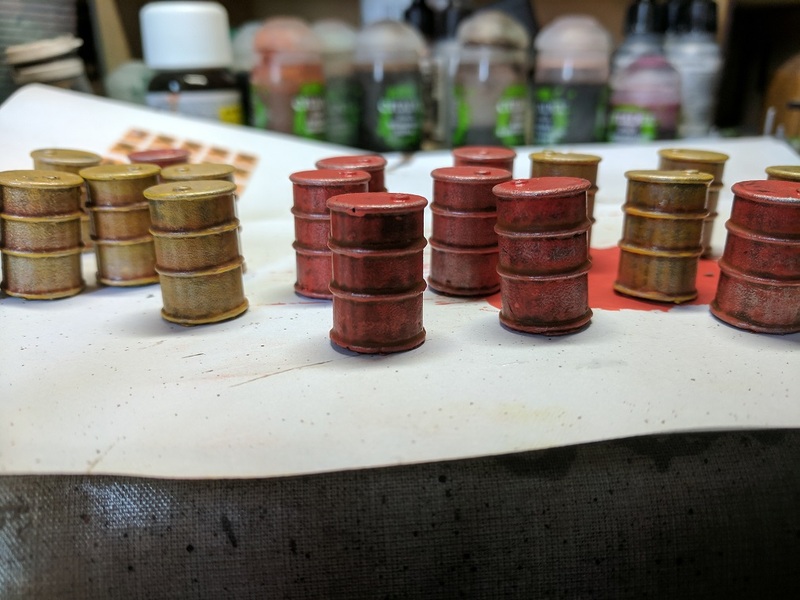 Next step was to paint the cap in the same silver then using a sponge i dabbed on some rough iron paint around the barrels to act as more aged darker chips and scratches. 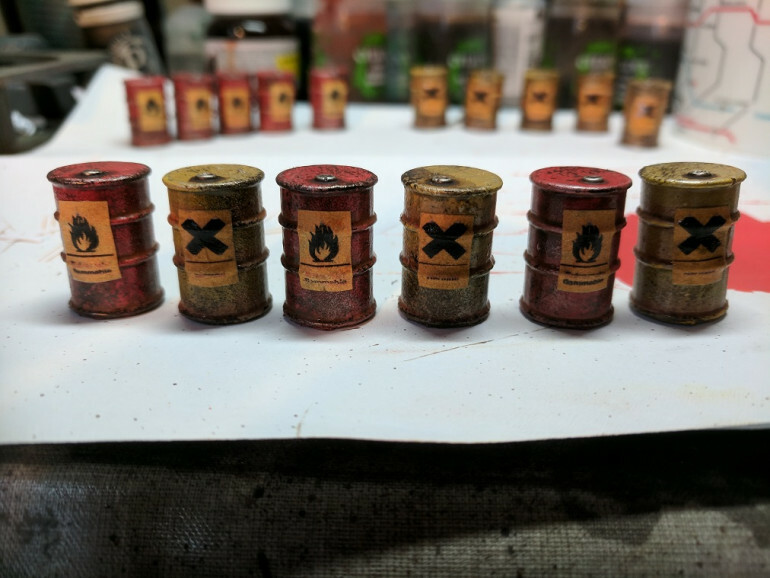 As an extra touch i printed off some hazard labels on standard printer paper and applied them to the barrels using PVA (don't add water to the mix. it ruins the prints) i used two standard hazard warnings, Irritant for the yellow and naturally the red barrels were flammable/explosive. 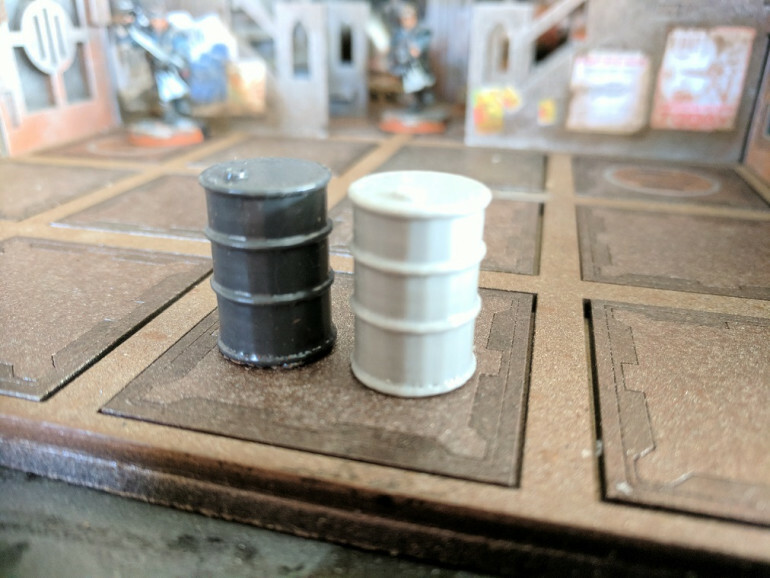 Since barrels are small and light it would be a pain to position them loosely on the board since they would probably keep on getting knocked over and rolling about everywhere so i decided to group them together and glue them to some of the board tiles, there were a couple which had a casting defect here and there so i added on a little bit of extra detail and had them leaking goo here and there, it is 40K after all. The completed barrels ready to provide...questionable cover to the gangs of the underhive, I'm playing around with the idea that these might be part of a mission where you have to save as many as you can, any stray shots could strike the barrels causing either an explosion, a poison gas cloud... or an exploding poison cloud! After spray painting the stairs i wanted to add in a couple of extra details to give that lived in look to the underhive. 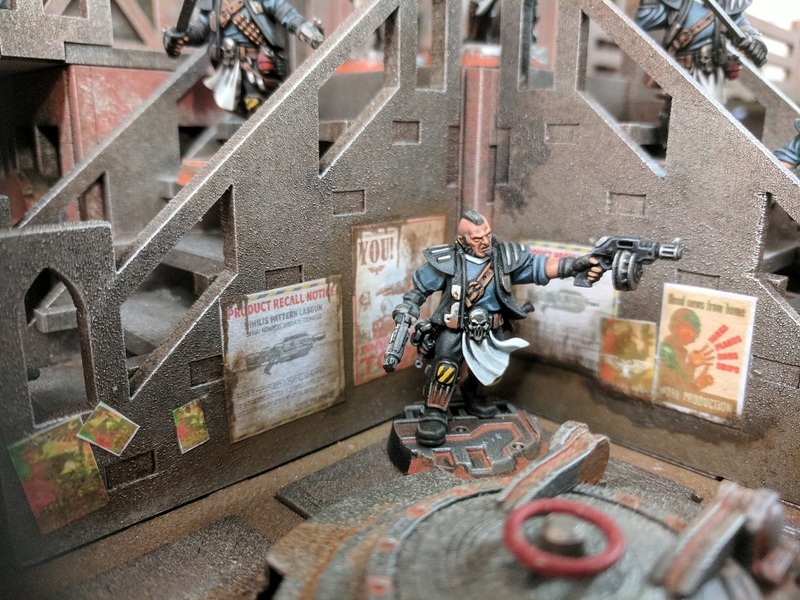 I remembered seeing a project from a while ago where somebody added some extra some extra life to their scenery by putting up posters, the video can be found here: https://www.youtube.com/watch?v=d1gpJruQiZk or the same idea again done by the games workshop team: https://www.youtube.com/watch?v=SgKlrzOJvRs I looked around online and found some nice poster ideas that i liked, resized them and printed them. 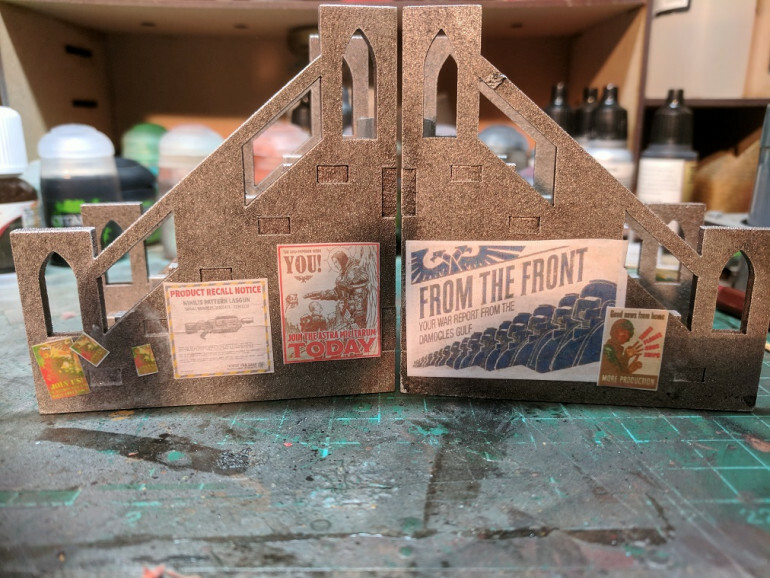 Glued the posters on with some basic PVA/Wood Glue. 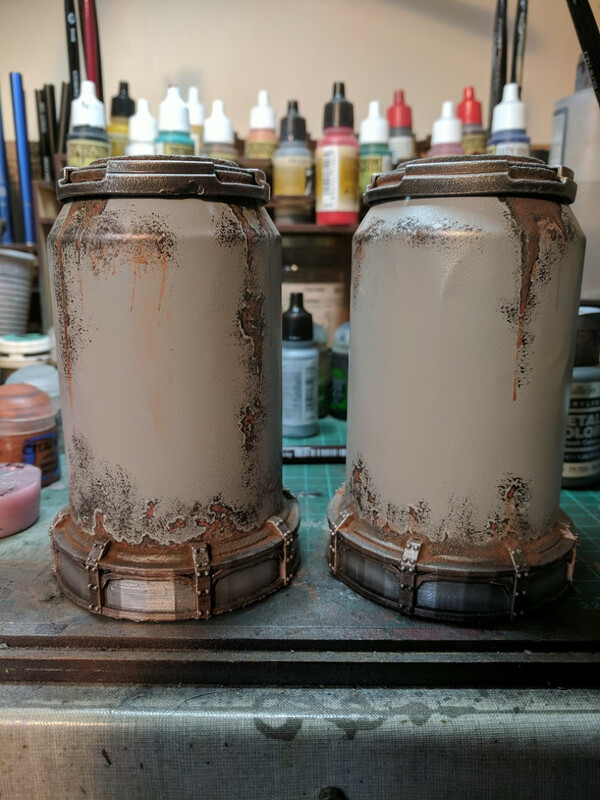 Finally added a bit of weathering, a couple of splashed of brown wash and/or some pigment powder should be enough to add a realistic worn dirty look to the posters. 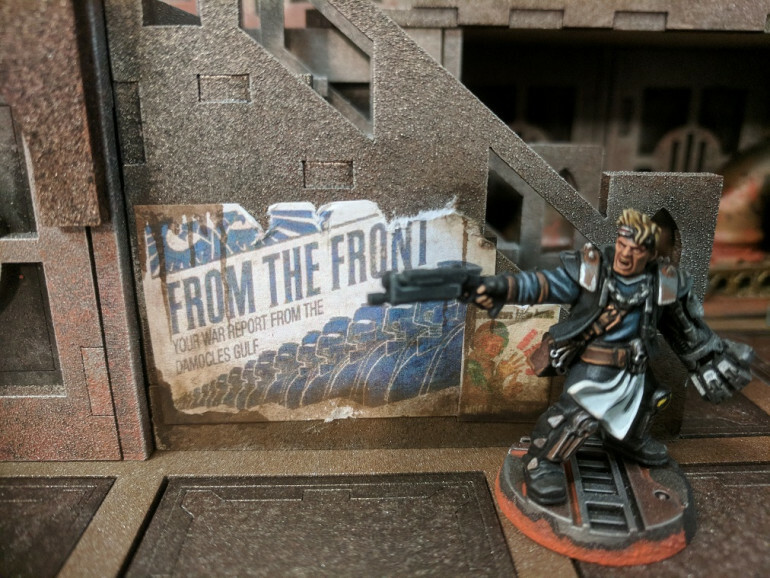 News from the front indeed, but this ganger has his own war to fight! 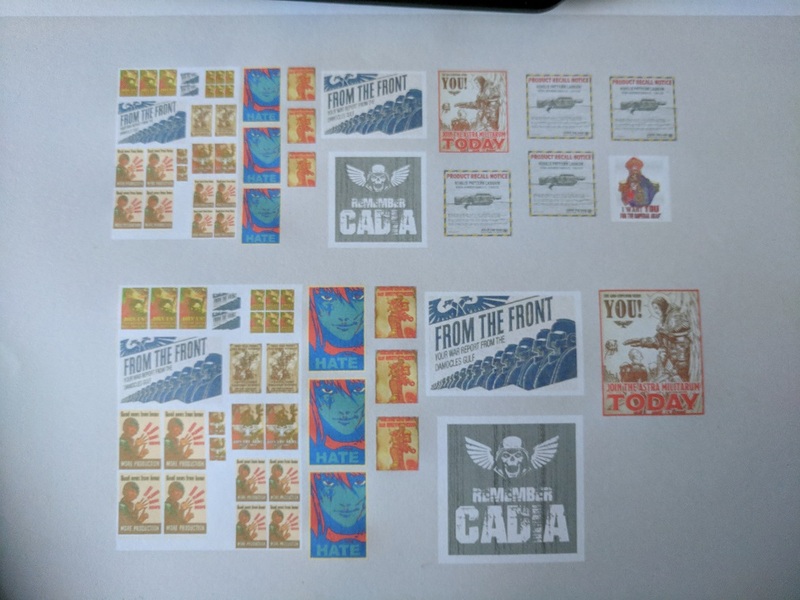 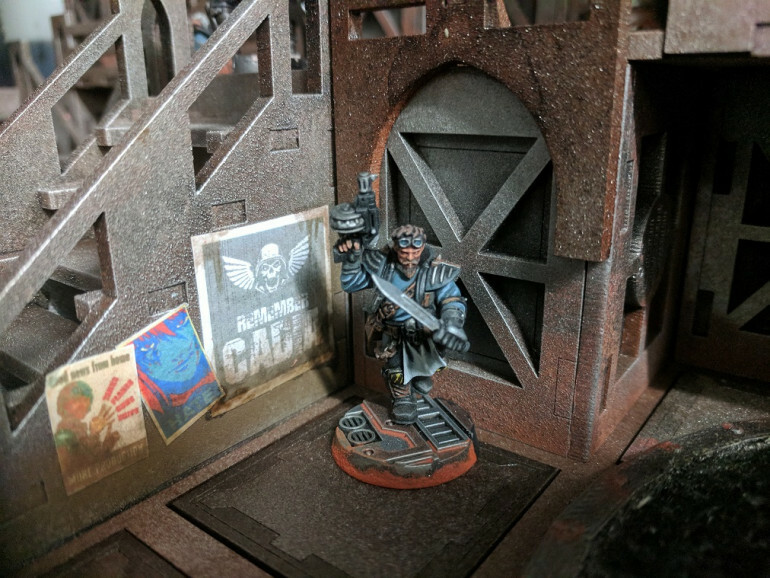 Remember Cadia? 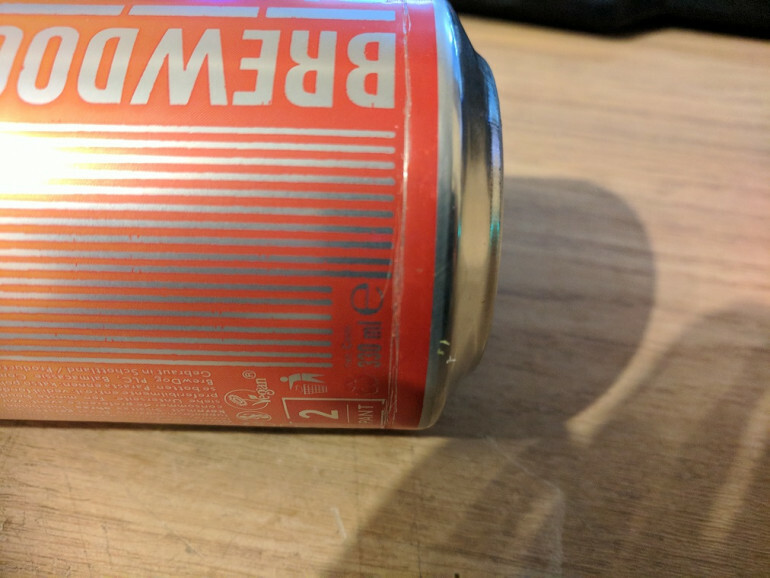 I dunno, do you? Step on up, Don't fall off the edge and cross those bridges when you come to them. 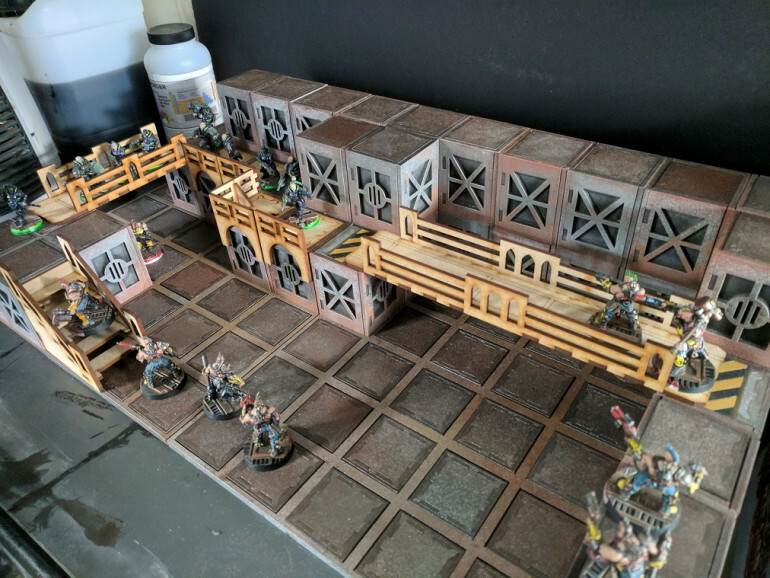 As stated before at the beginning of the project I wanted to make the modular board suitable for both 2D and 3D play areas so the addition of stairs to reach upper levels was a must as was bridge sections to cross between raised areas, I also felt that any upper areas should also have a line of rails around the outside edge to act as both cover and add a bit of realism. 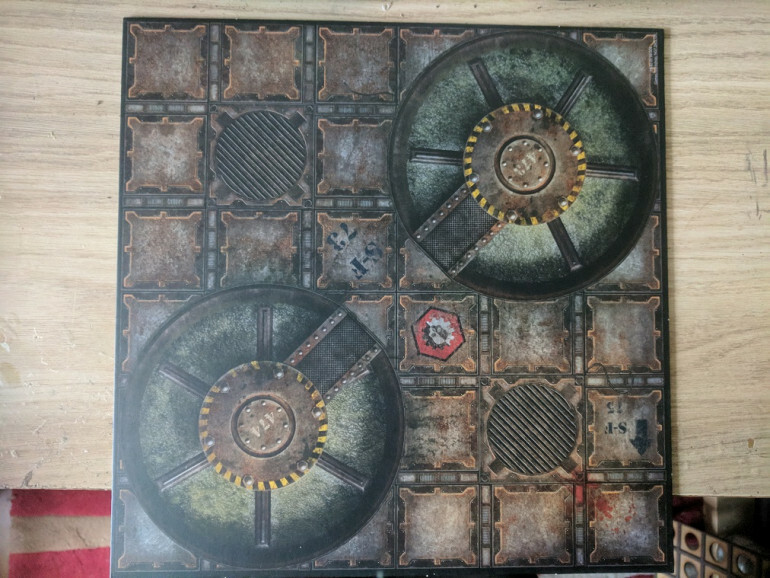 As you can see, the board when built up looks a little barren, lacking any real scenery or areas to move up/down or across. 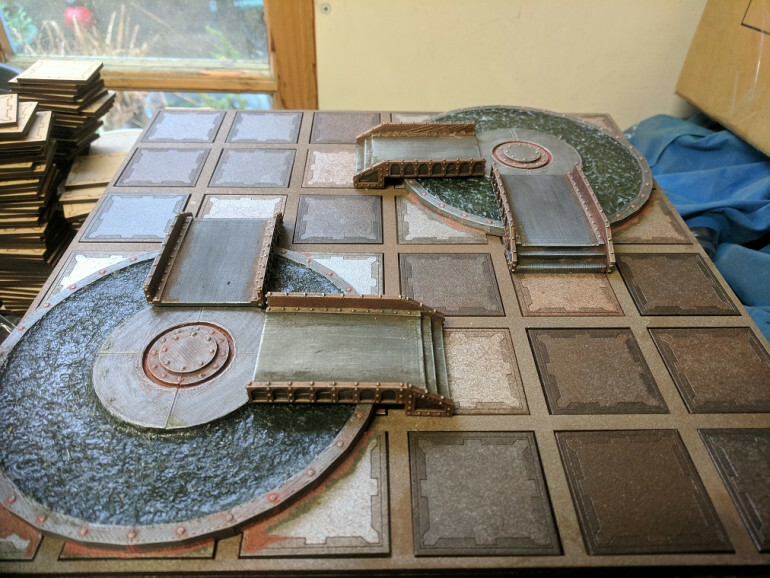 The same board layout, now with the added stairs, bridges and rails, much better! Added on some miniatures to give an idea of scale. 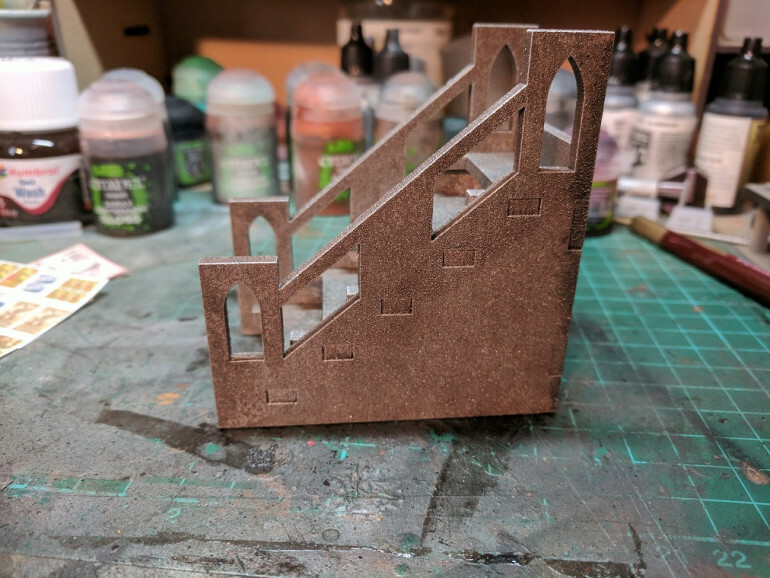 Another nice feature is the stairs are pretty much functional with enough of a flat area and gap to sit miniatures on both size bases. 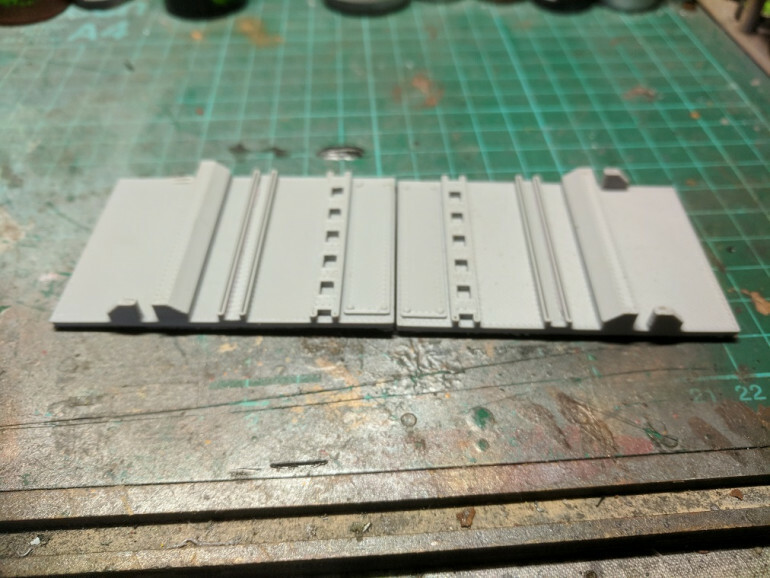 I Started with the base, nothing fancy but i wanted a couple of tracks in the middle then some spaces along the edge for fixtures and fittings. 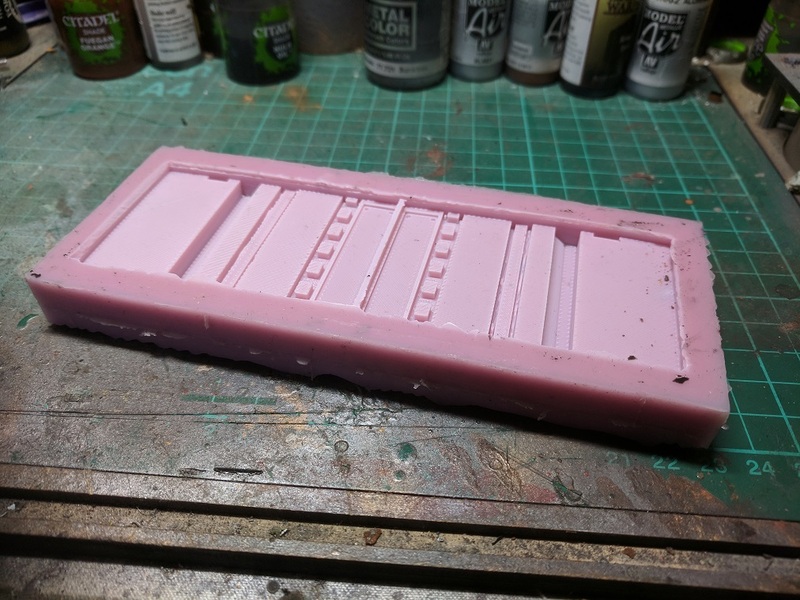 I had a feeling that i would need quite a few track pieces so i opted to make resin casts rather than reprint them over and over again, if anybody is interested in making rubber moulds and re casting in resin i can recommend DWR plastics in the UK, great products and relatively cheap. 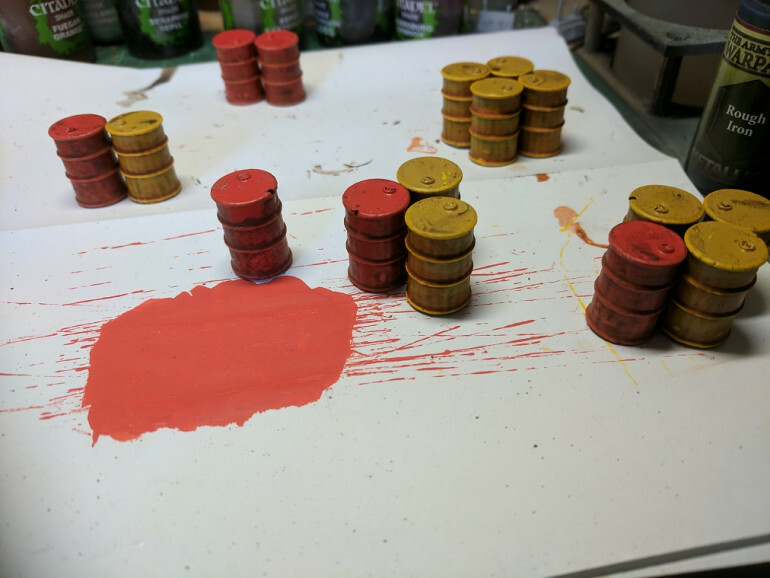 and then started casting copies of the original. 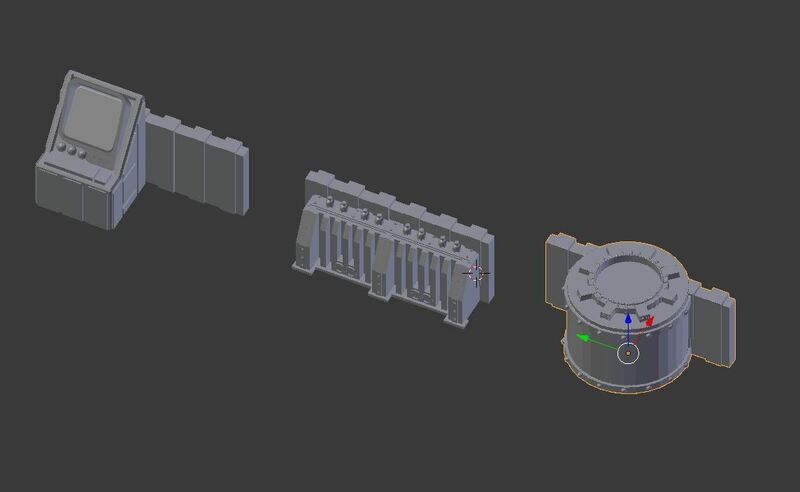 For the edges i wanted some variation, control consoles, power banks and housing for the assembly arms. 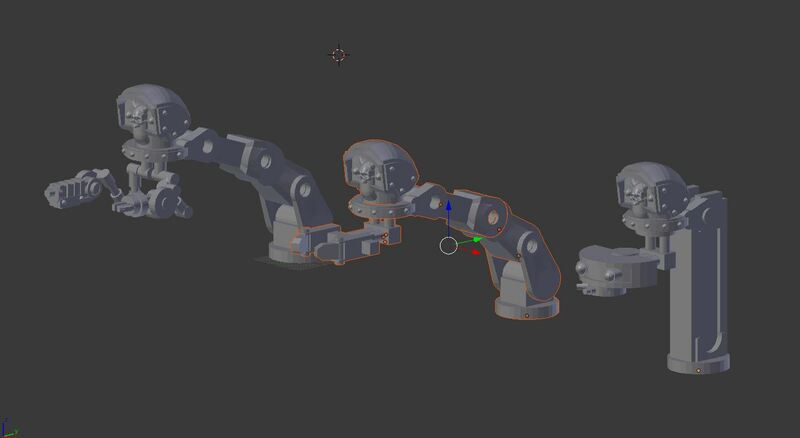 and for the assembly arms i went for 3 variations, heavy tool arm, claw and scanner. 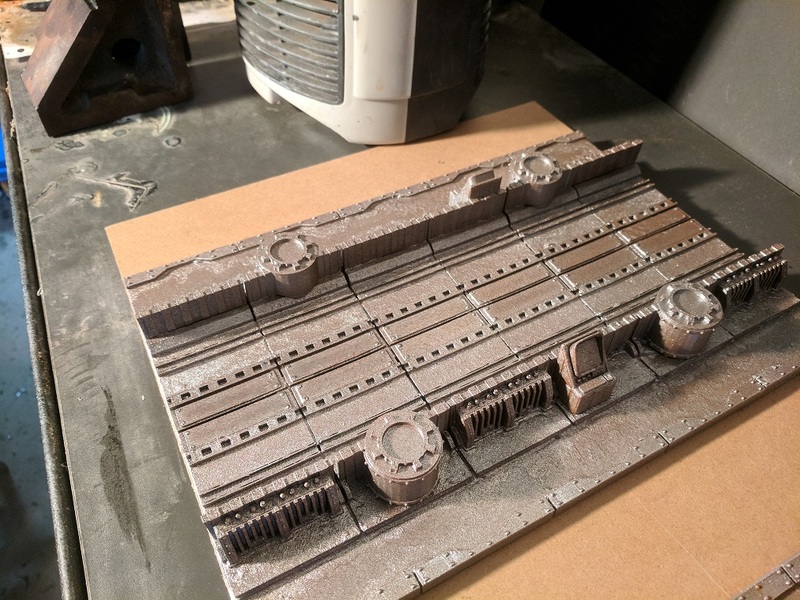 I took the casts and mounted them on some foam board, than added some printed edging, once everything was assembled i gave it a heavy spray of light and dark silver then a light mist of rust paint. 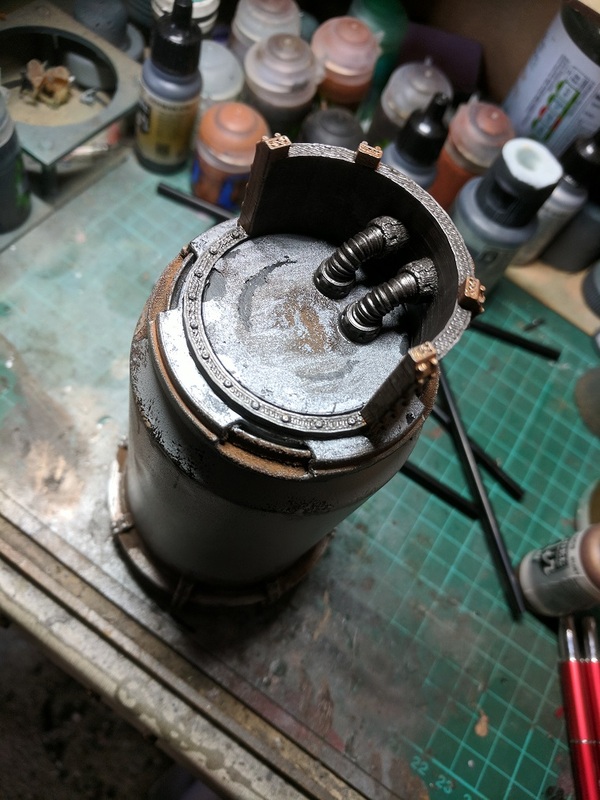 with the addition of some weathering effects and the finished assembly arms things were starting to look good. I repeated the process again to make a second track which would spread across the board, i will probably do this one more to get a really long track... but for now here is some Orlocks ambushed by soime Van Saar.... industry stops for nothing... not even a firefight. 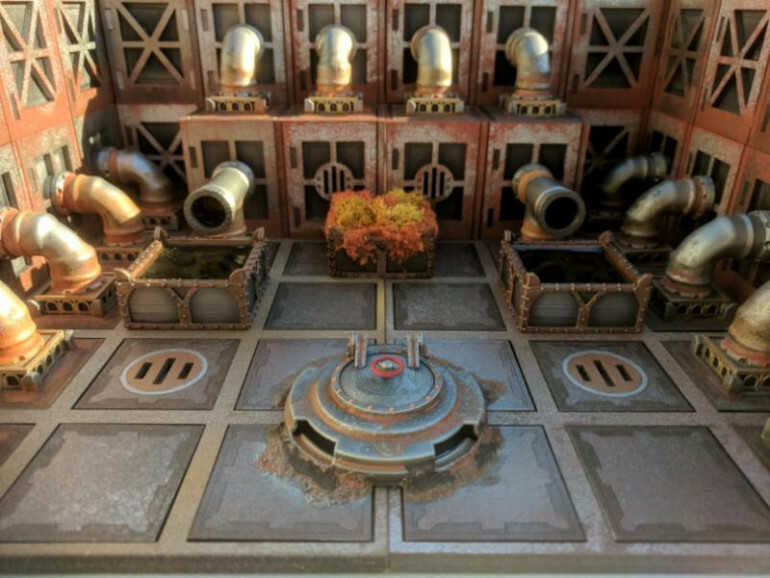 looks a bit run down, but the foundations look strong. 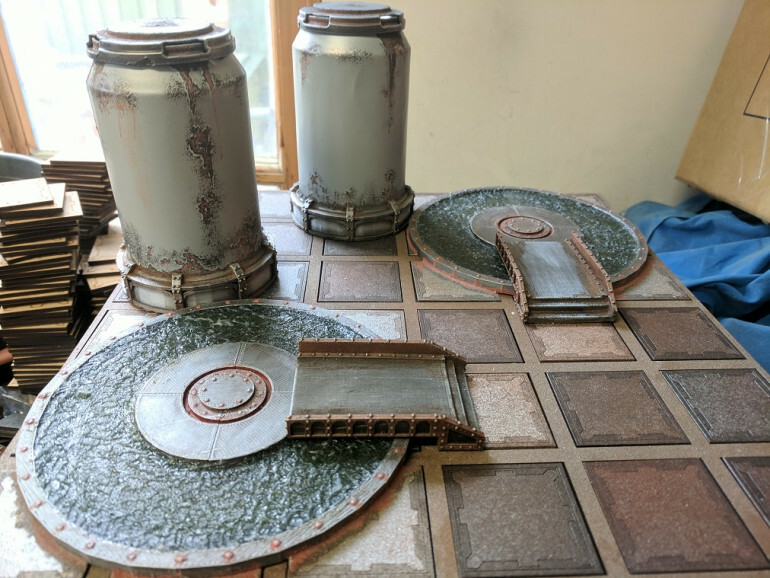 The tanks looked ok when i made them but when placed on the board seemed disjointed and out of place, the best way to get scenery to look natural is to add on a base which blends the transition between board/mat/playing area and the scenery itself, so its time to add on a base to one or both of these tanks. 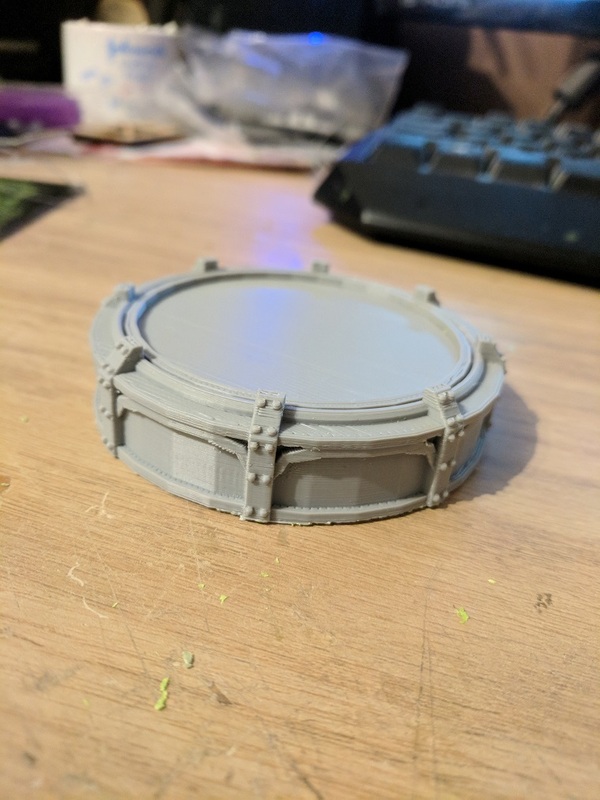 For the base i wanted just a simple raised area with a "filter pool" so i went for the model makers best friend "foam card" nice an easy to work with. 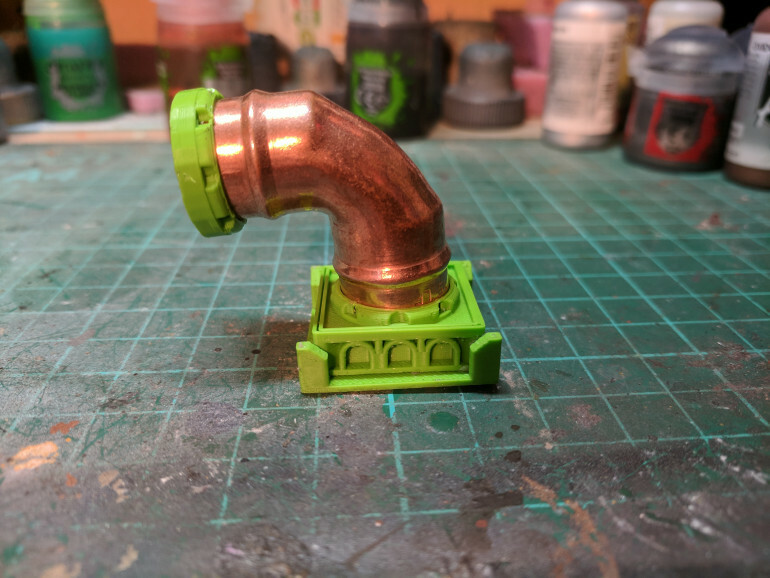 for the pool i printed out a smaller cup and for the bottom of the tank i added in a little addition for extra pipes. 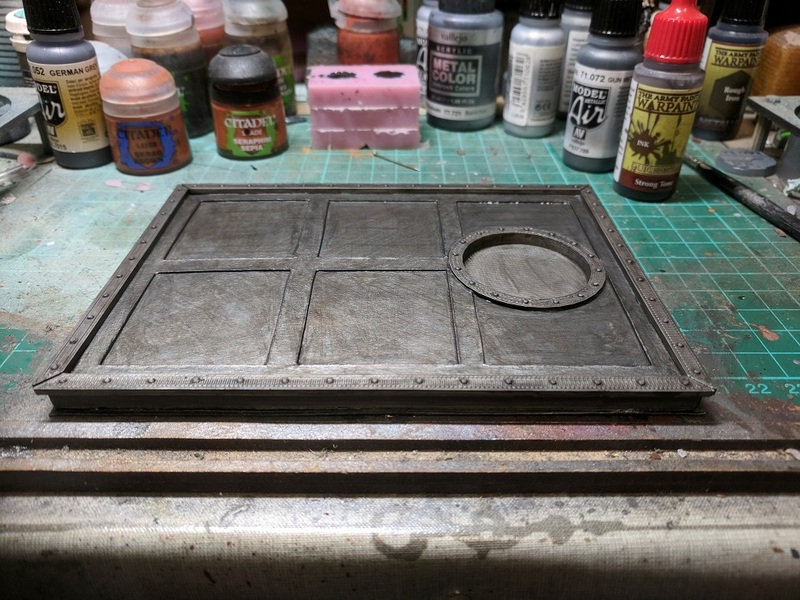 I took some thin card and cut out some squares and glued it to the top of the foam card just to add a bit of texture then printed off some edge pieces to form a border around it all before spraying in all in a dark silver primer. 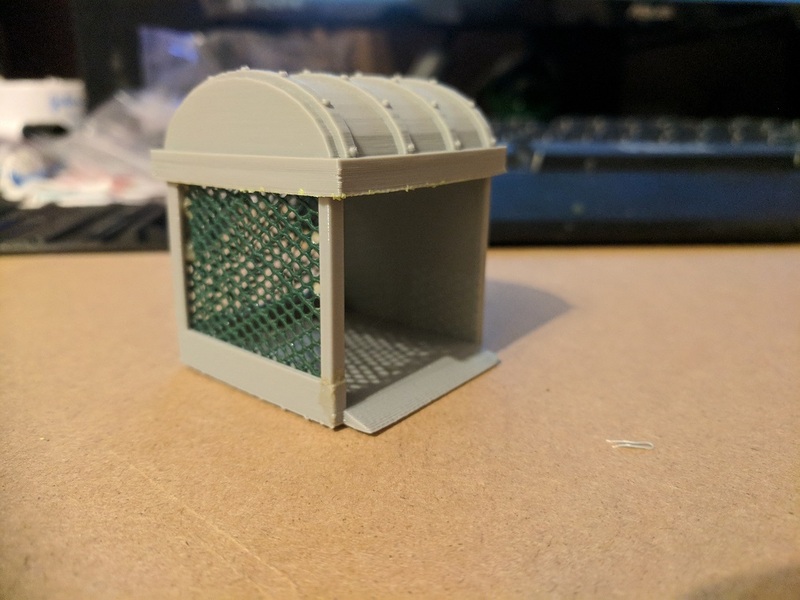 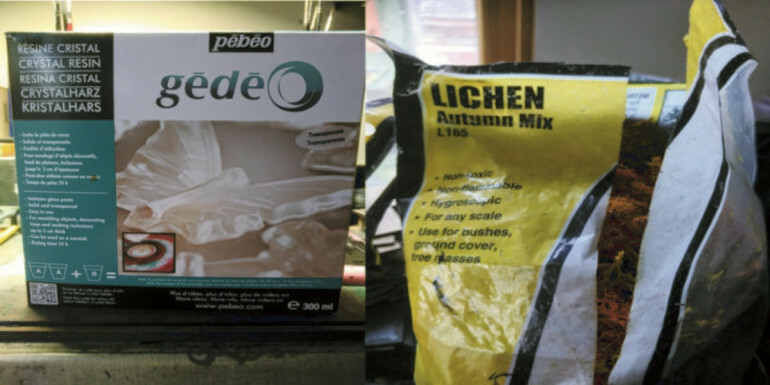 I also wanted something in which the sludge would be vented to, the hut was Printed but the green mesh was from a garden centre, relatively cheap for metres of the stuff and ideal for making fences. The filling station assembled complete with fences and ready to be added to the rest of the base. The vats look fine on their own but i wanted to take them a little further and add some functional scenery to the top as well as showing where the vats are filled, i decided the best way to do this would be to add an extra layer to the top which would have connections for pipes as well as acting as cover. 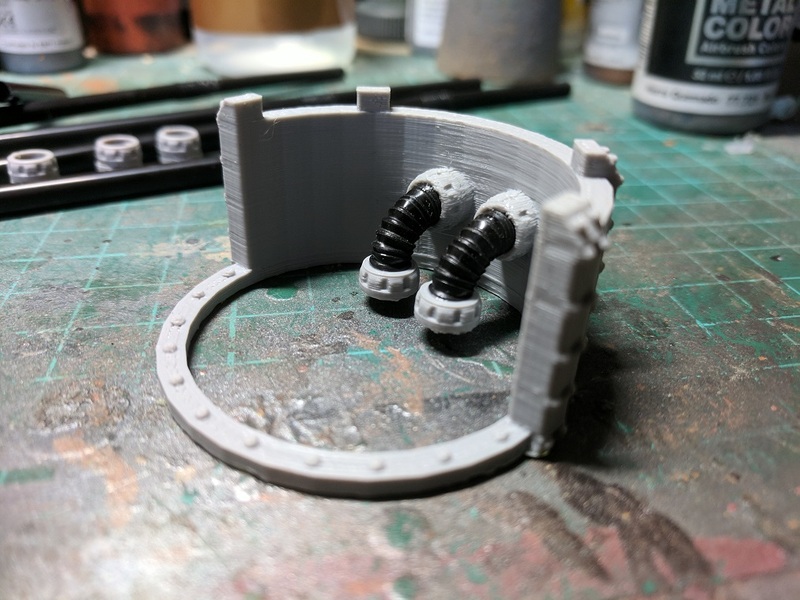 I build up a wall to add to the top of each tank, each wall would have a circular ring designed to fit over the brewdog plastic beer can holders and also have two holes designed to take standard 5mm drinking straws. 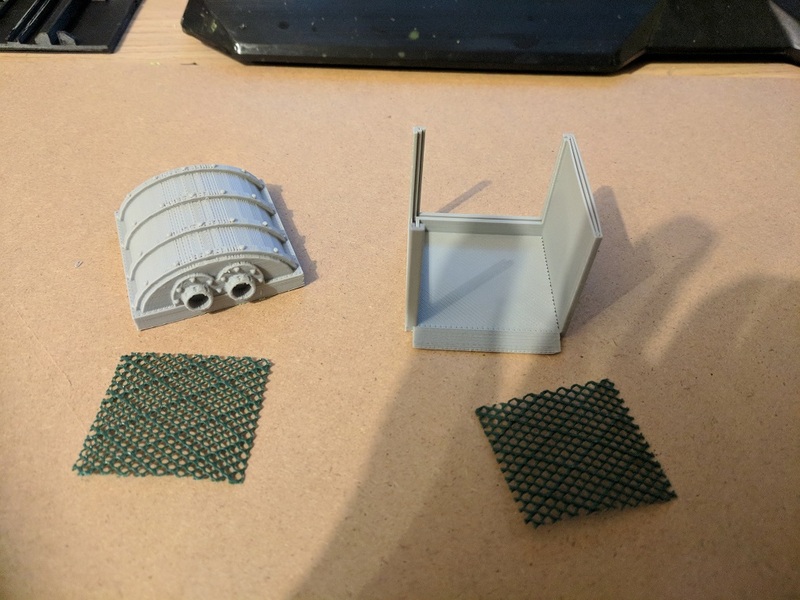 I printed off the cap ans also printed off some small 7mm rings which would slide over the straws. 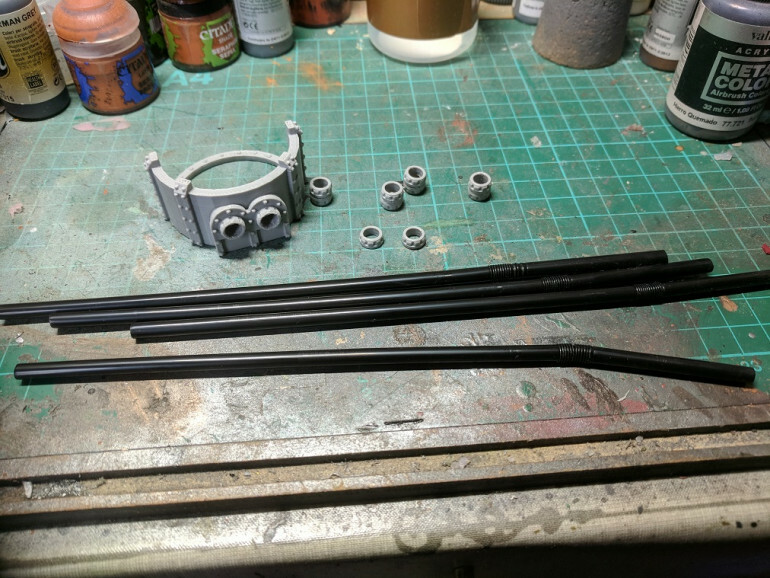 Cutting off the bendy section to each straw i fitted a ring to the bottom of each as a base. 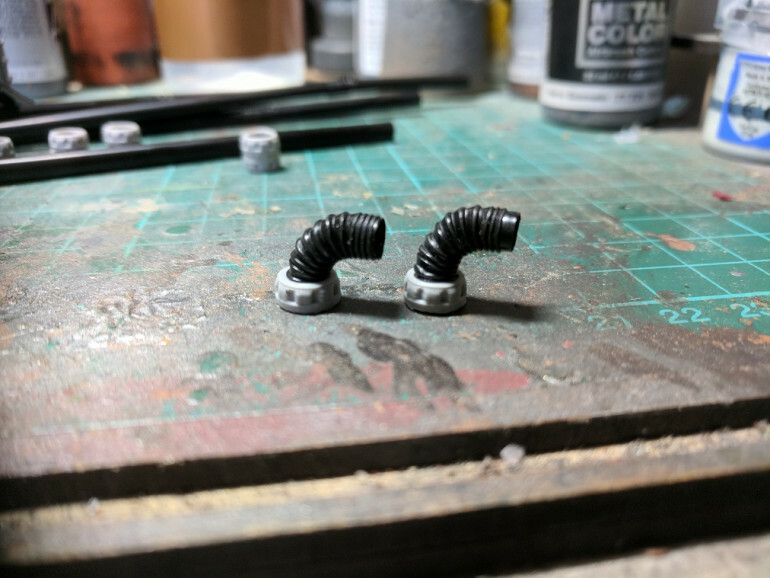 I fitted the pipes to the inside of the wall, its only a small detail but it adds a bit of realism to the piece. 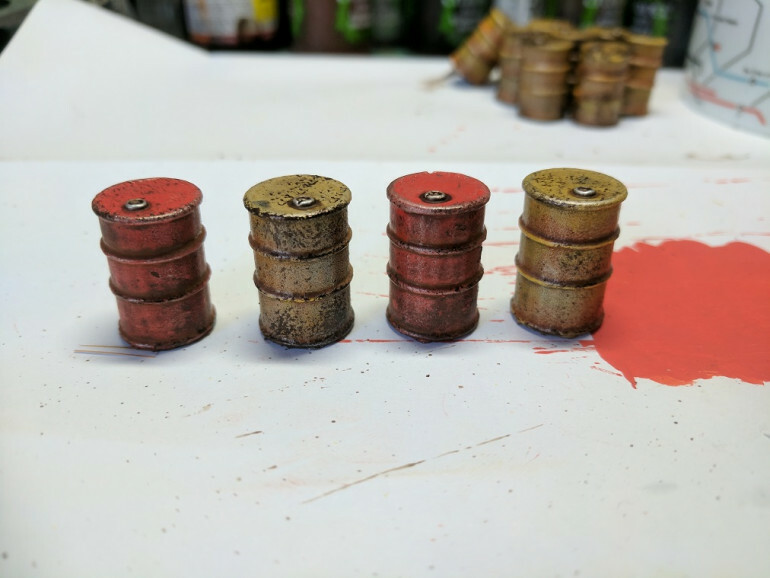 The finished cap panted up with gun-metal and rust from Vallejo and washed with strong and dark tone inks from army painter. The inside of the cap, unfortunately fitting the piece caused the paint work on the original cap to chip and flake but nothing another layer of paint wont fix. 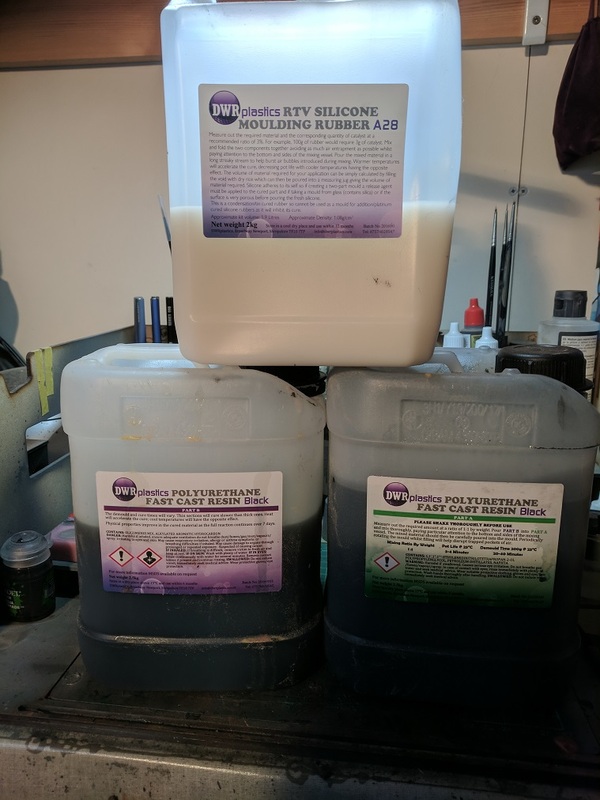 I wanted a couple of collection silos for the sludge vats and what makes great silos?... Empty cans! I started by scoring the edge where i wanted to cut with a good hobby knife and then went over the same lines a couple more times, this makes it much easier to get a good clean cut. 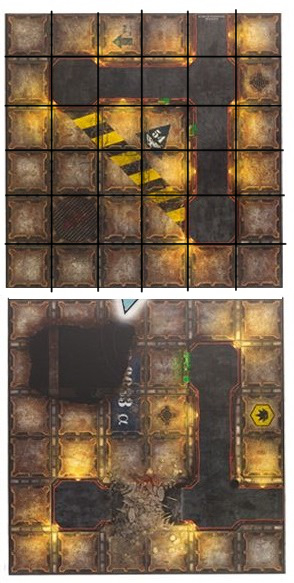 With the guide line in place its easy to judge if the line will be fairly straight or if it needs to be scored again. I cut off the bottom of the can then replaced the plastic cap from the pack holder, this will add some more detail to finished piece. 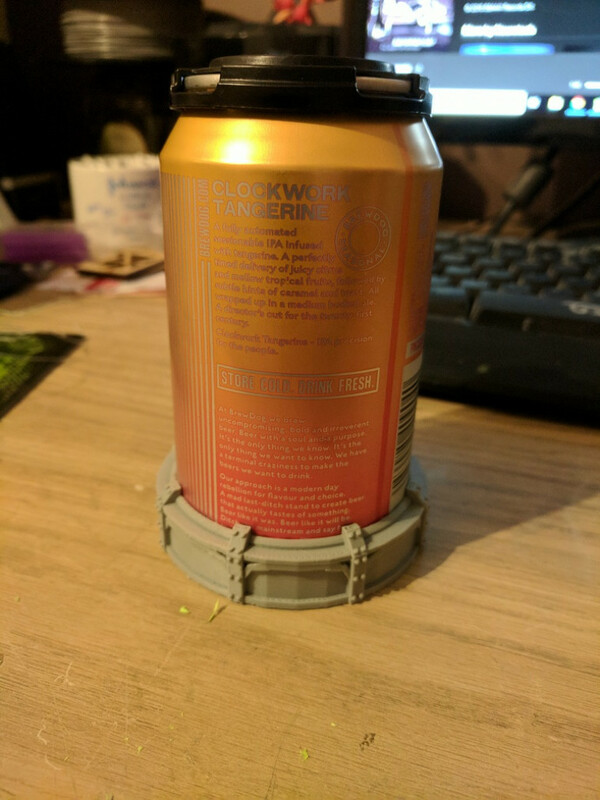 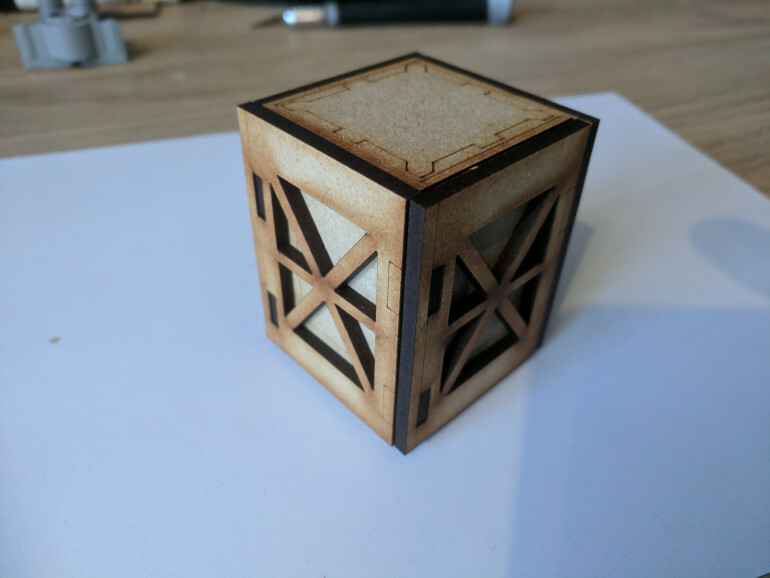 Printed out a suitable base which the can will be fitted onto, i wanted something that looked industrial but ornate at the same time. 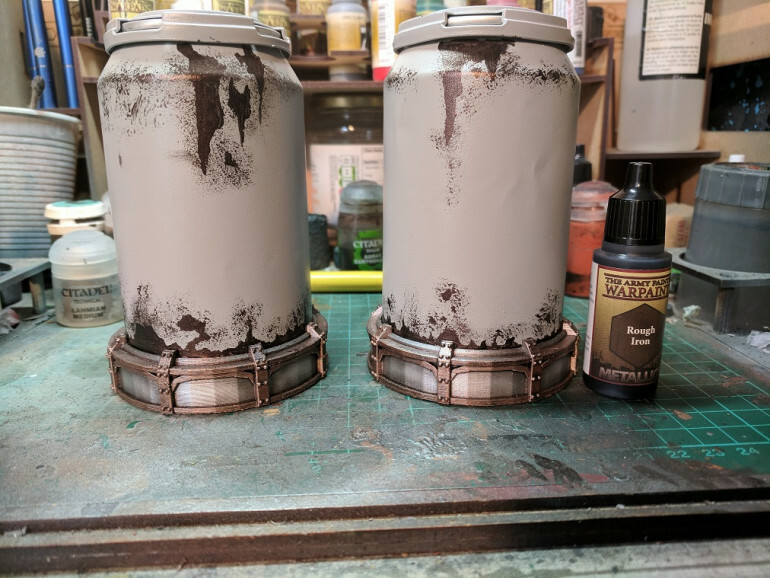 The can and base together, things are looking good so far. 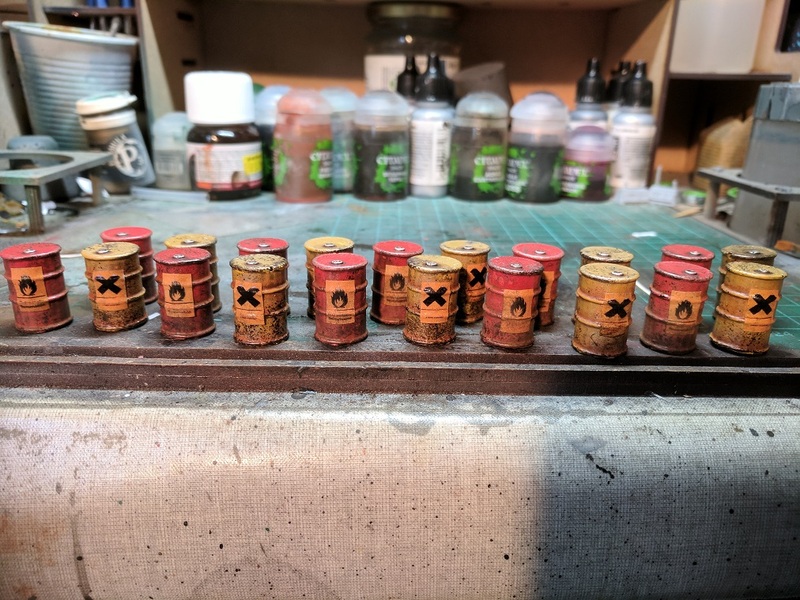 First layer of paints, metals done in the usual fashion, the can sprayed in a standard grey primer and for the rust/chipped paint base i used rough iron form army painter. 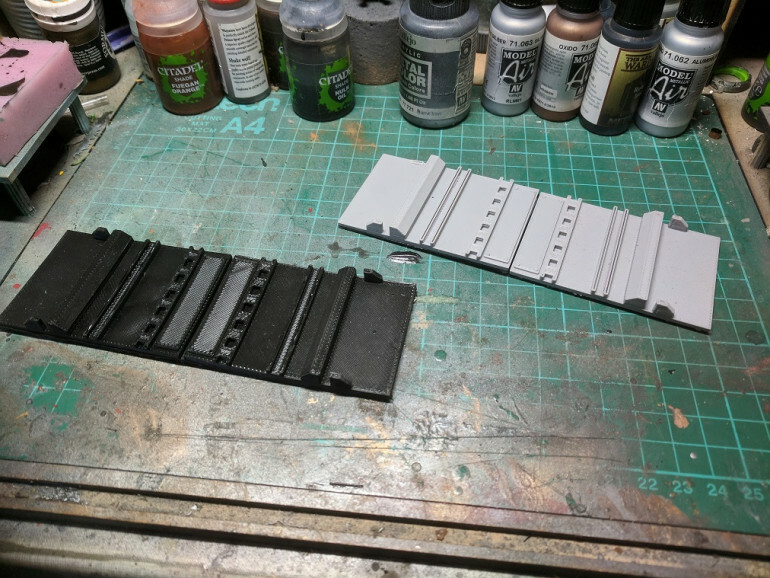 Edged the chipped areas with some light grey paint to add a bit of depth. 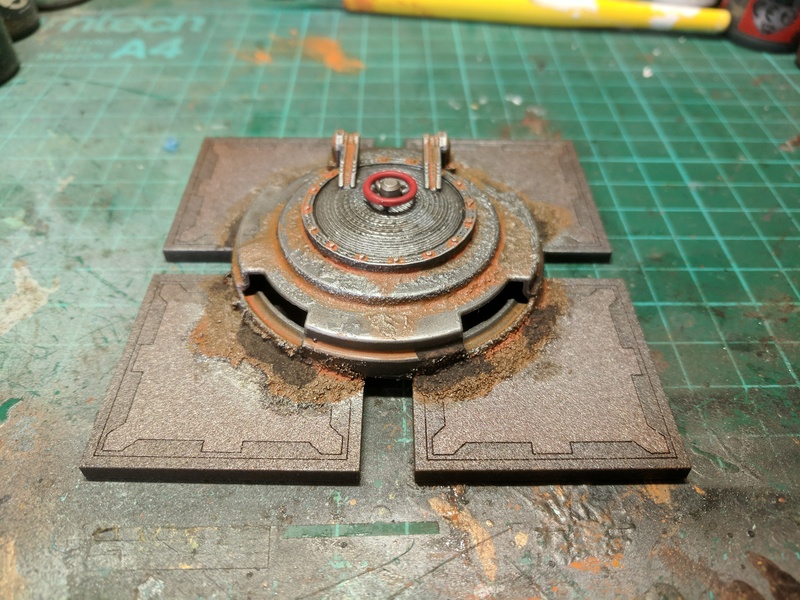 Then finally added on my rust mix and iron powder to add a it of texture and colour before finally drybrushing in silver paint. In the Underhive Sometimes it's best NOT to know where your next meal is coming from. Keeping with the subject of water and vegetation i decided to make the sludge vats from the delta-7 badlands board expansion set, essentially big holes in the ground filled with slime which passes for food in the underhive. 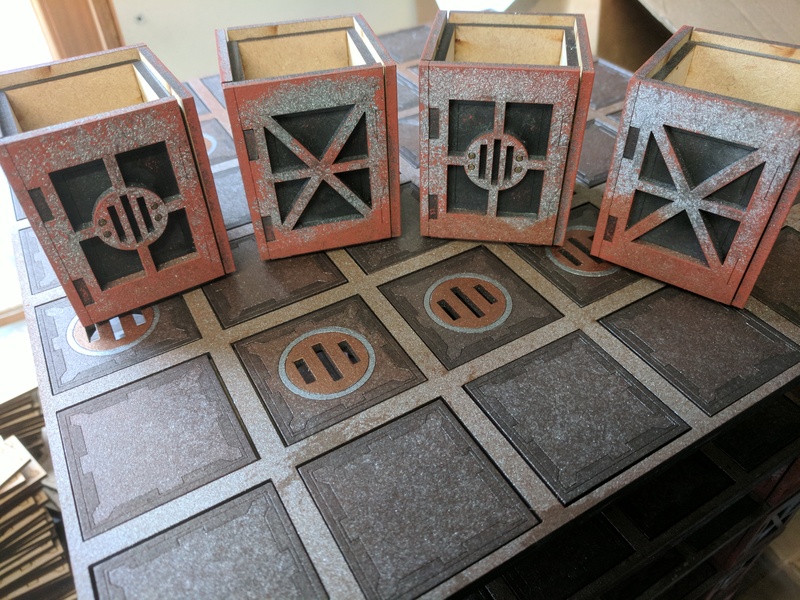 Made up the vats in the 3D printer then painted them using the usual metal and rust combinations. 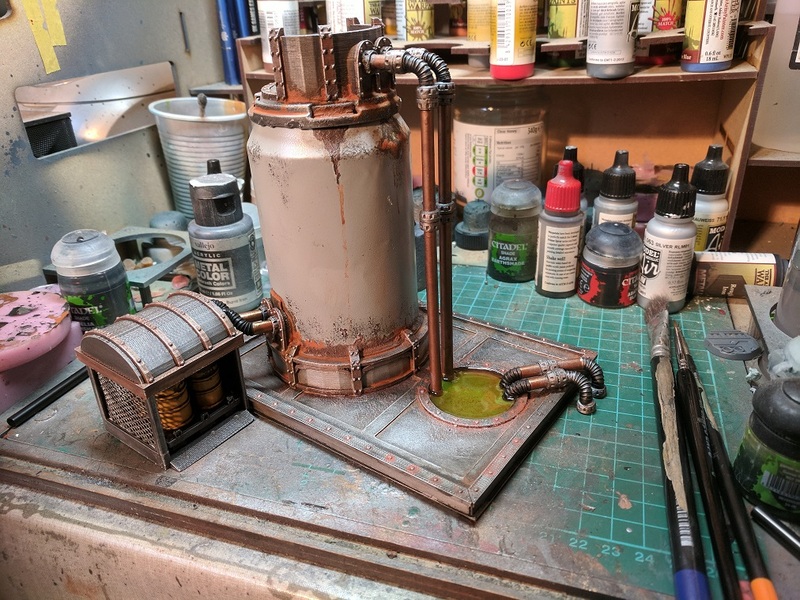 the inside of the vat was painted with death world green before being filled with the liquid crystal resin from the last project. The wave effects were made by dabbing on some of the woodland scenics brand of water effect paste. The vats each had a bridge but i decided to make 2 for each to give a few more options when setting up. 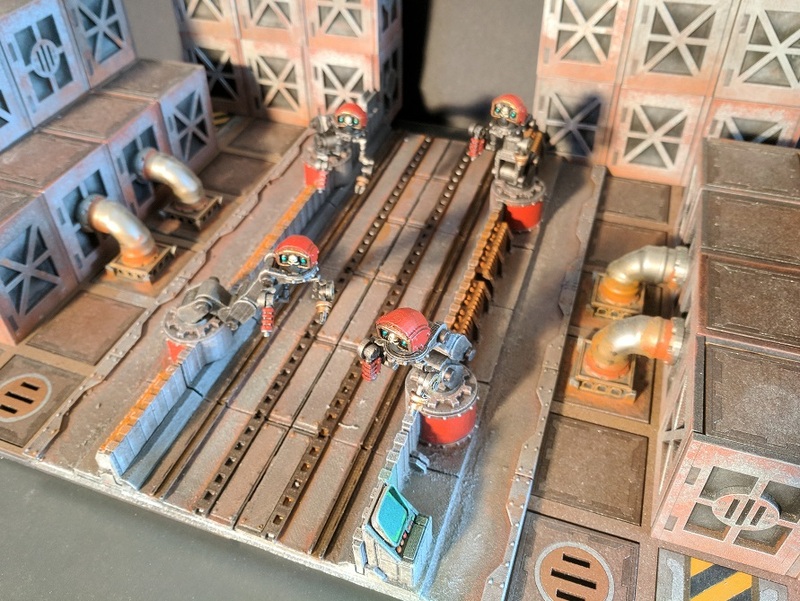 The finished vats with the bridges. 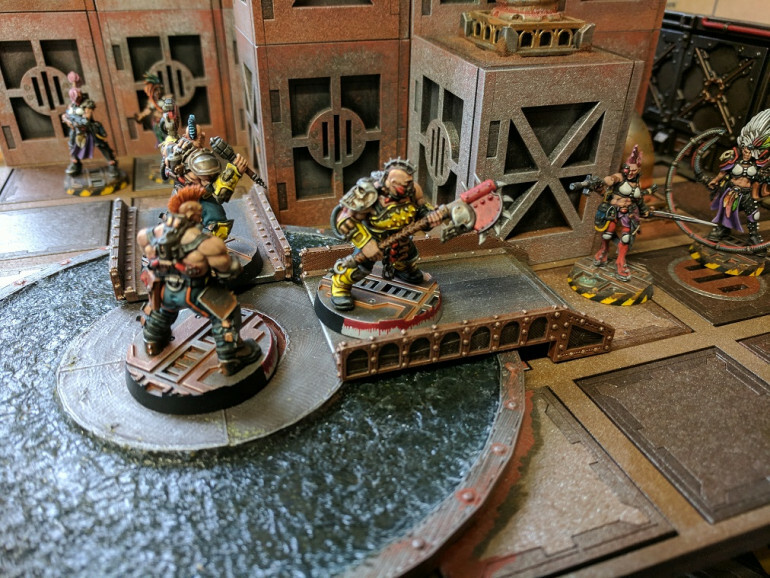 I like scenery which limits movement or provides obstacles to traverse, looks like these Goliath gangers have fallen into an Escher ambush.... Time to sink or swim. For the next part of the project i thought it would be nice to throw in a few scenery pieces that could act as obstacles or barricades but also add in something a little more unusual to the background, i figured the hive would have things like water basins to collect pipe run-off or even provide some kind of growing area for lichen, moss and ferro-weeds. 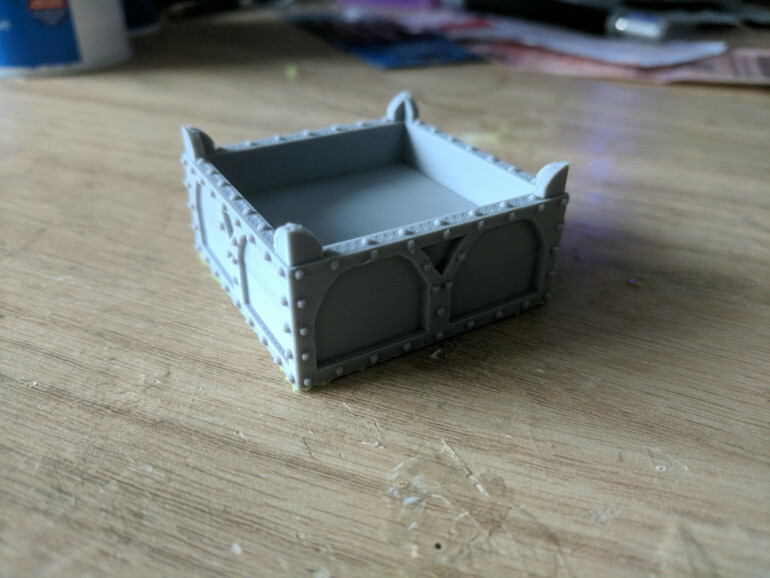 I put together a simple box and added in some Gothic flourishes, some arches, raised corners and of course lots of rivets. 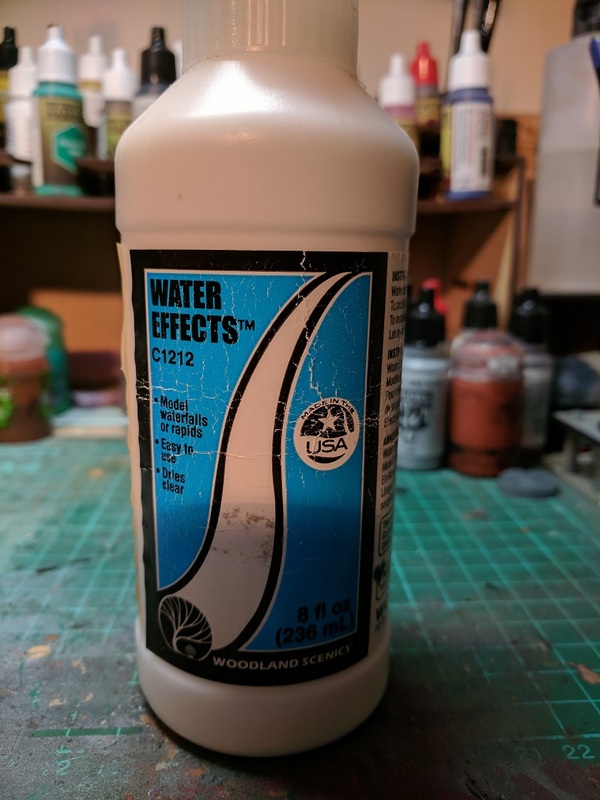 For the water effect i used some liquid crystal resin, not exactly cheap and I'm sure there are some cheaper versions out there but i had some left over from a previous project. 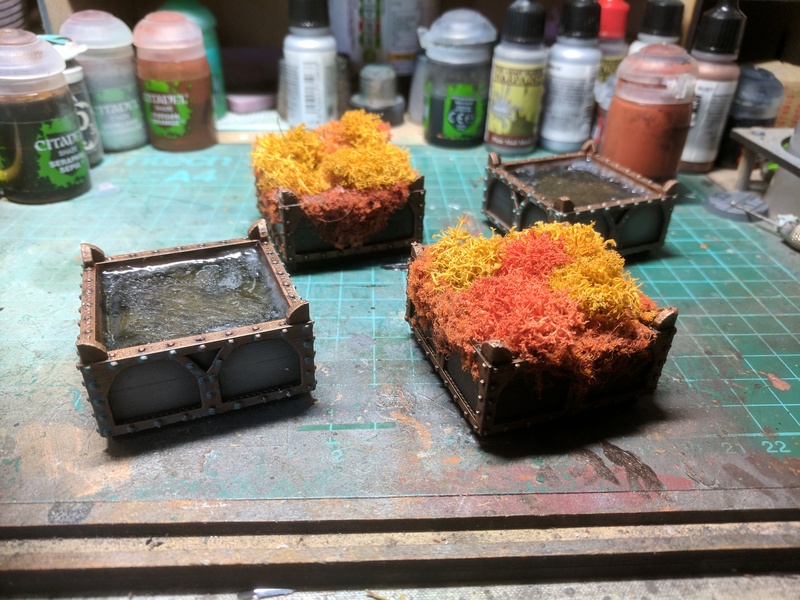 For the moss i went for the woodland scenics range of autumn lichen, i didnt want anything too green or vibrant since the vegetation would most likely be half dead, under artificial light or was a species that had evolved to eat rust and metal. Painted up the boxes using standard dark metal and brass colours then added in the resin to a couple and glued the lichen into the others. 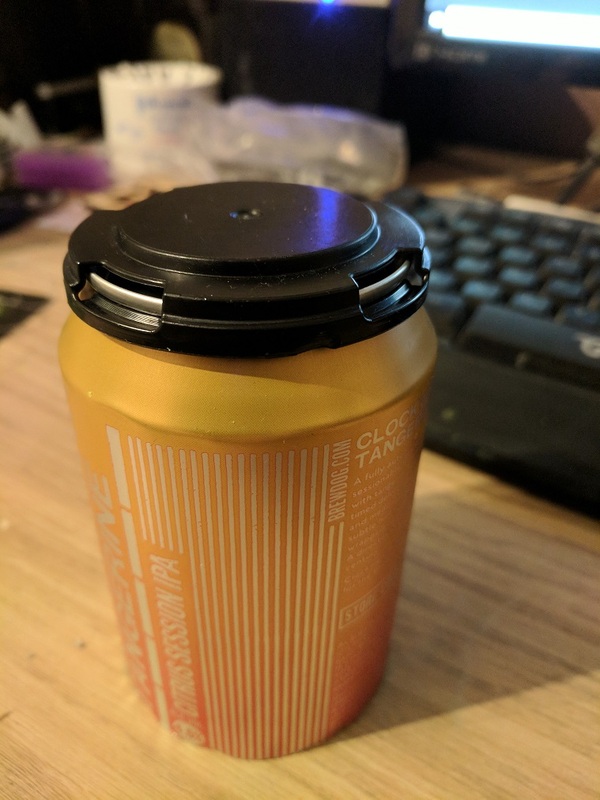 Welcome to Flushing Waste Springs.... 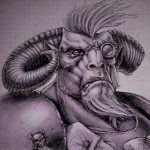 Please don't ask us about your lost jewellery, baby Sump-kroc or missing Juve... you really don't want to know! Lower your tone and bring it together. 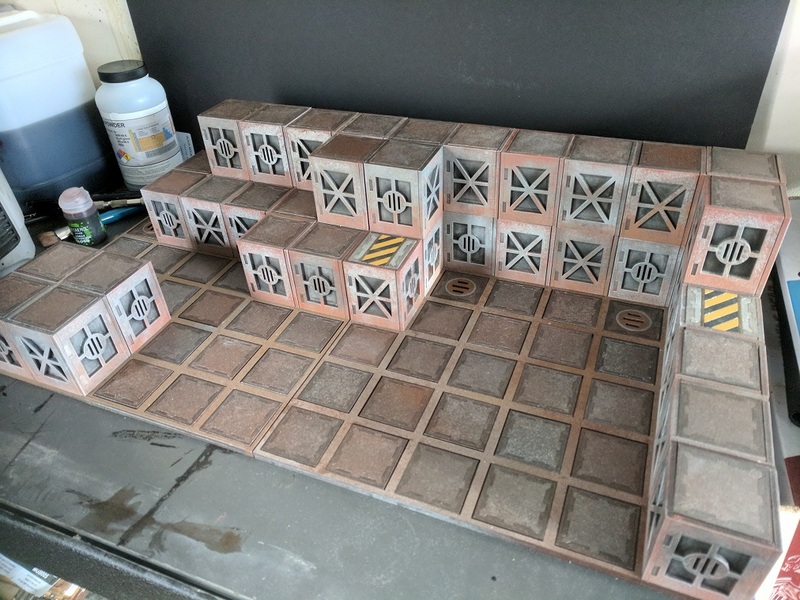 When i started this project i really wanted to limit my painting jobs to spray can and sponge stippling only but looking back at the original paint job on the construction cubes i decided that it did look a bit iffy, the rust effect was very strong and different brands of paint were definitely showing. 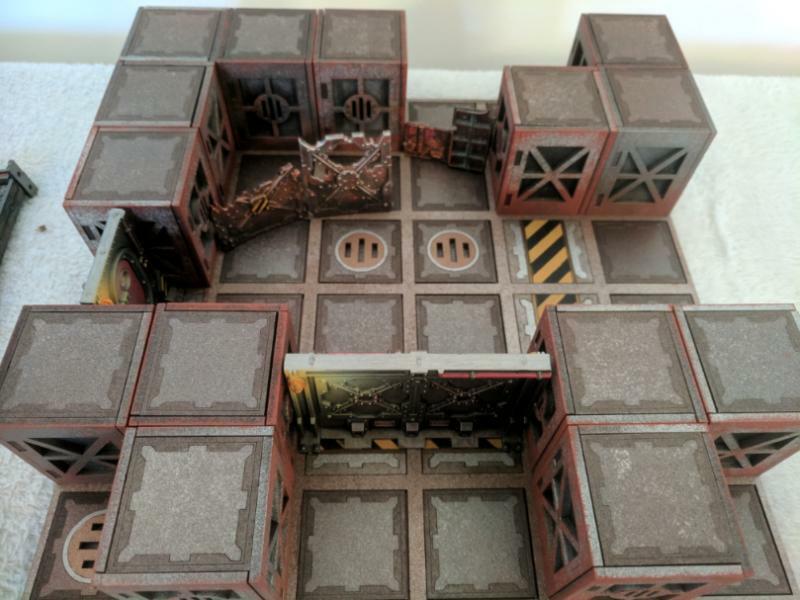 I went back to the original cubes and attacked them all with a heavy drybrush of a light silver tone, it took about an hour but the difference was worth it, the silver paint toned down the rust effect, highlighted the textures from the paint and generally brought the colour scheme together for all of the cubes making them look a bit more unified. 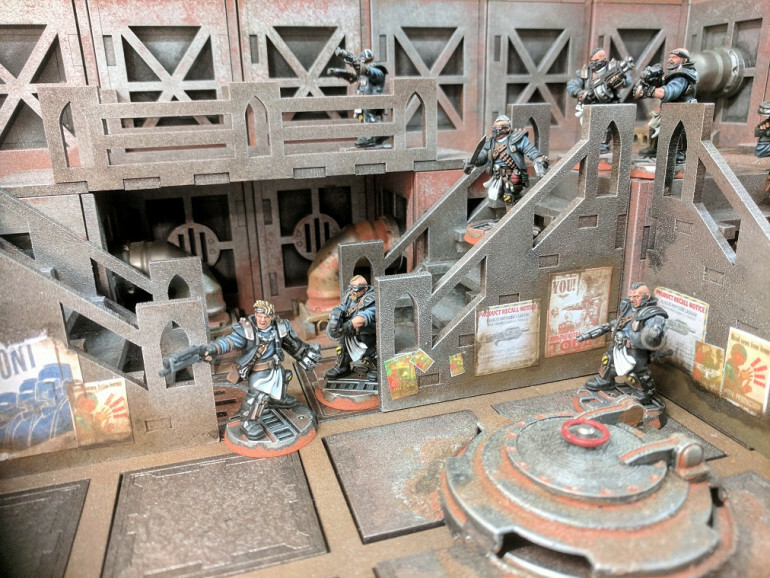 when placed together the colours matched up much more effectively and the muted tone on the rust now allowed other pieces of scenery to stand out more against the background. As mentioned before the boards were missing detail, they looked good on their own but they needed something extra to give that hive city feel. 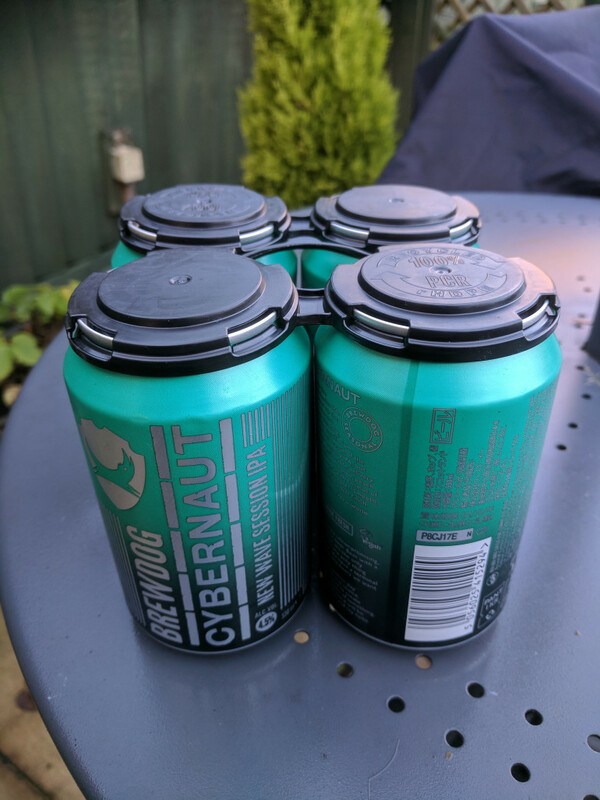 I picked up some beer with my weekly shopping and looking at the pack holders i had an idea. 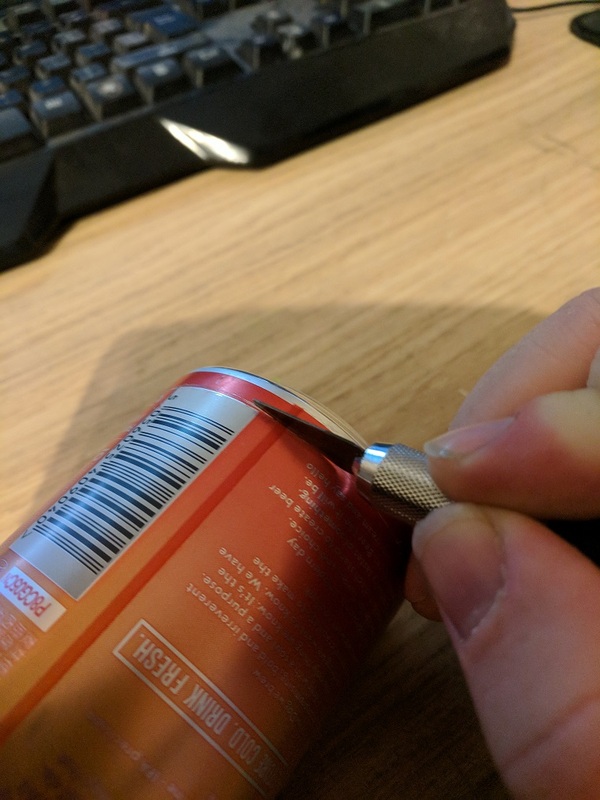 Removing one of the caps i cut off the extras to leave me with just a single circular section of plastic. 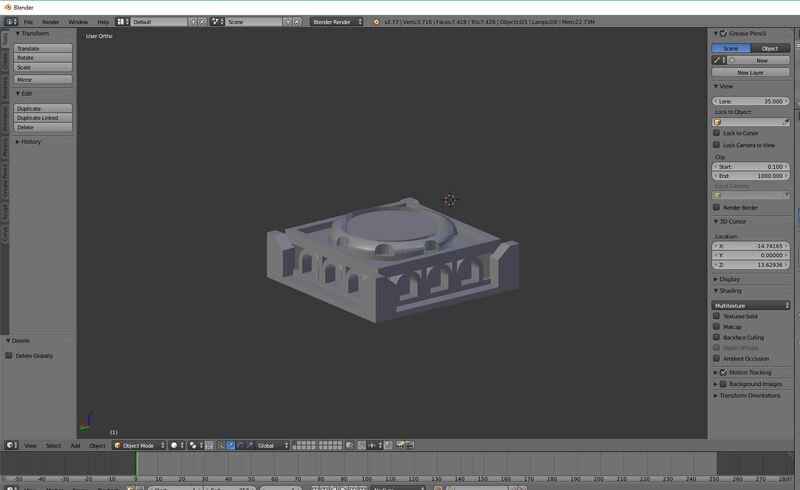 Jumped back into Blender and built up a quick submarine hatch. 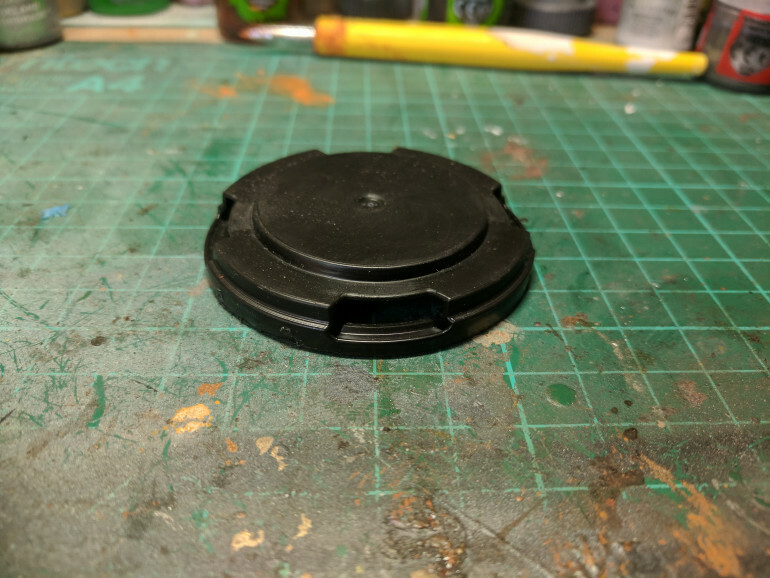 Glued the pieces together and added one of the hatch handles from the Necromunda underhive kit to top it off. 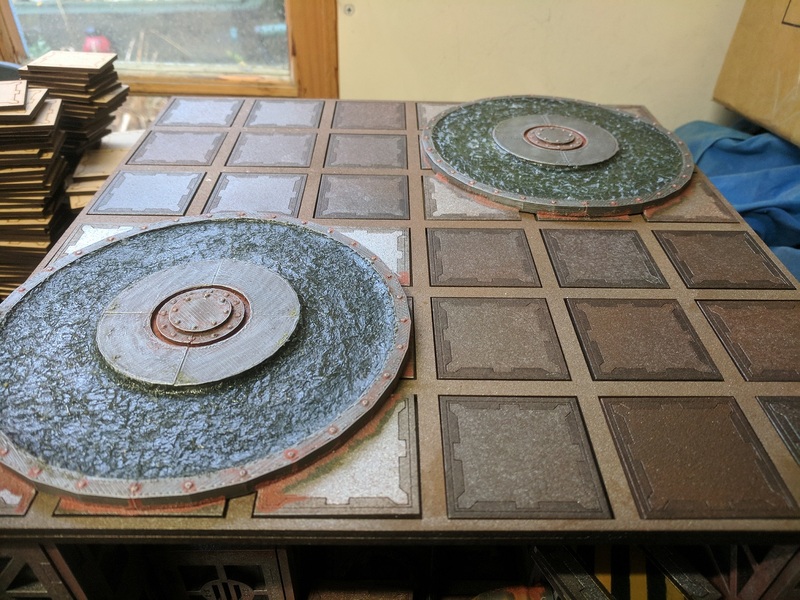 Sprayed the whole thing in Lead Belcher and weathered it with the usual combination of washes and added in some watered down skrag brown and rust effect paints before finally gluing the piece to 4 tiles from the board. 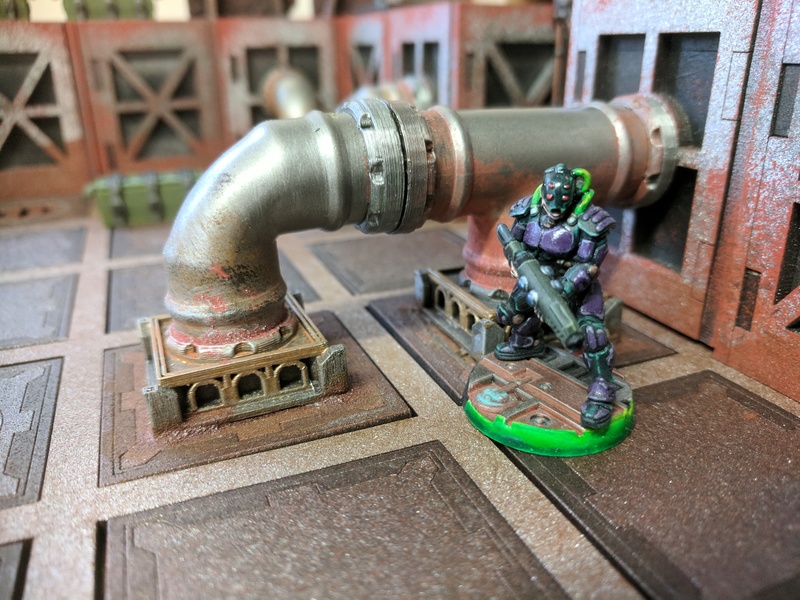 With the addition of the pipes made previously and the new hatch the battle now has a bit more flavour to it, I imagine something like the Goliaths trying to wrestle control of an important transit hatch off the defending Orlocks in one of the Hives Sludge processing zones. Going to need a bit more than WD40 to shift that. 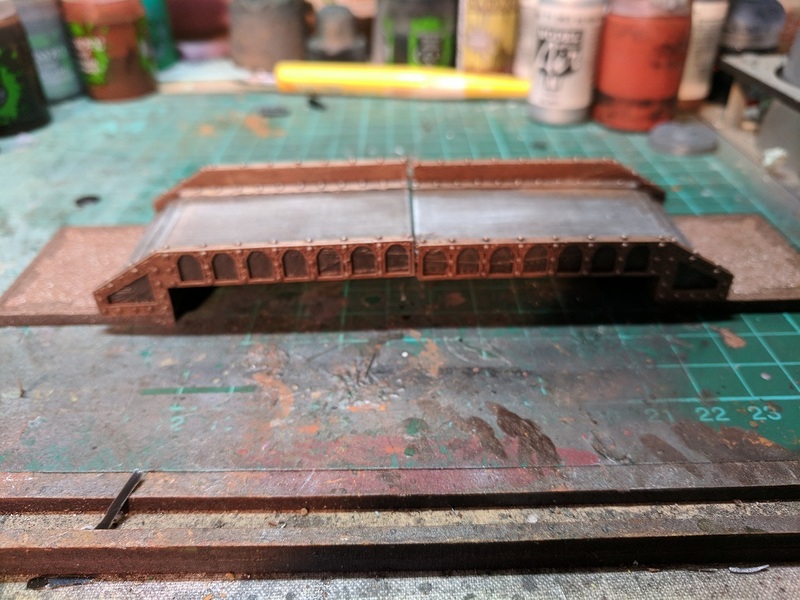 I really want a lot of my scenery to have a heavily rusted dirty appearance so i decided to try a little experiment using artist medium, iron powder and humbrol weathering powders (iron oxide and rust). 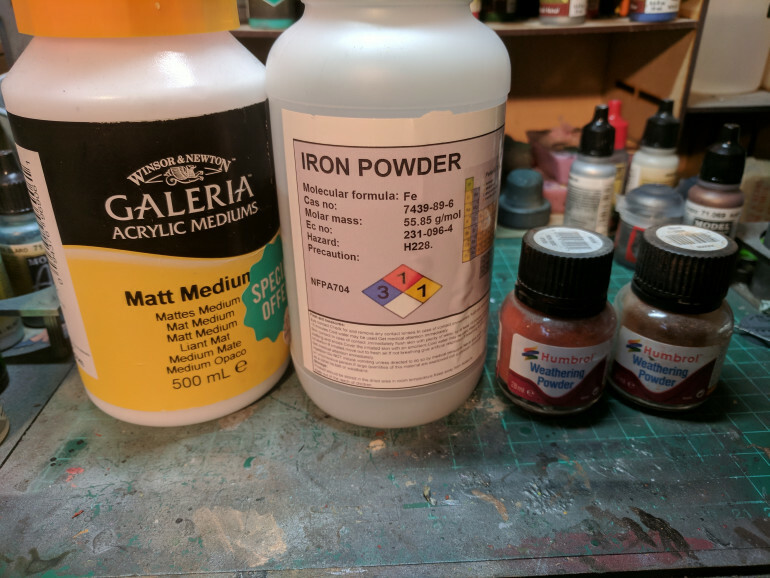 The base components to my rust paint mixture. 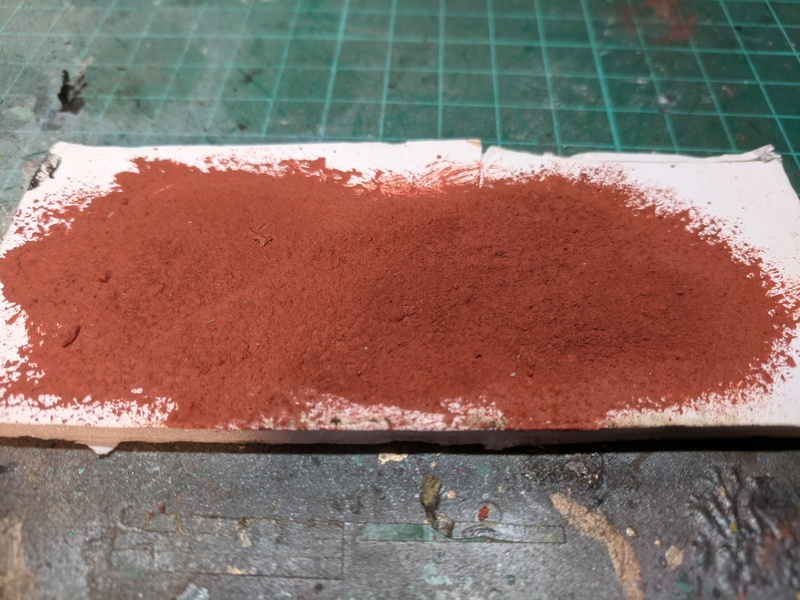 When applied in thick layers the iron powder and weathering powders build up a rough texture and when dry the paint has a slightly powdery look. 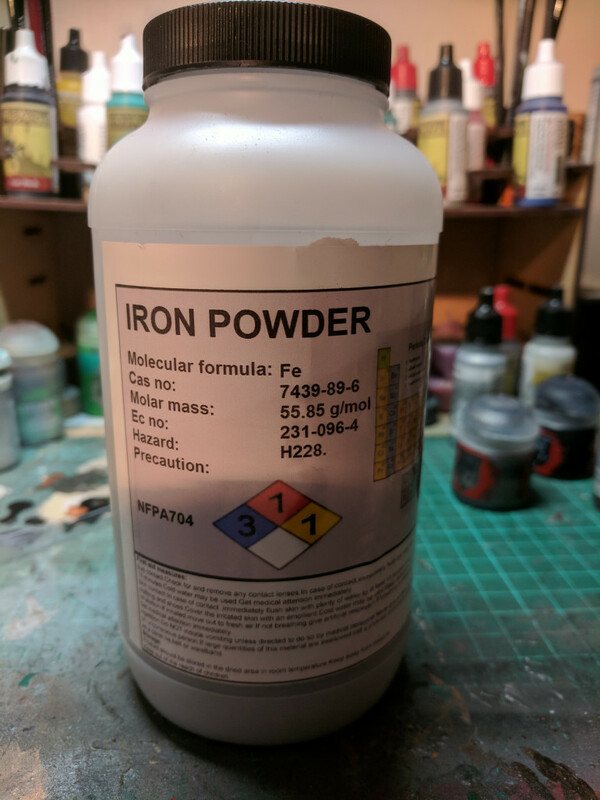 Another thing about iron powder, it oxidised incredibly fast. Mixing some iron powder with some PVA glue and water makes a decent fine texture paste which starts to take on a natural rusty look within hours of application. 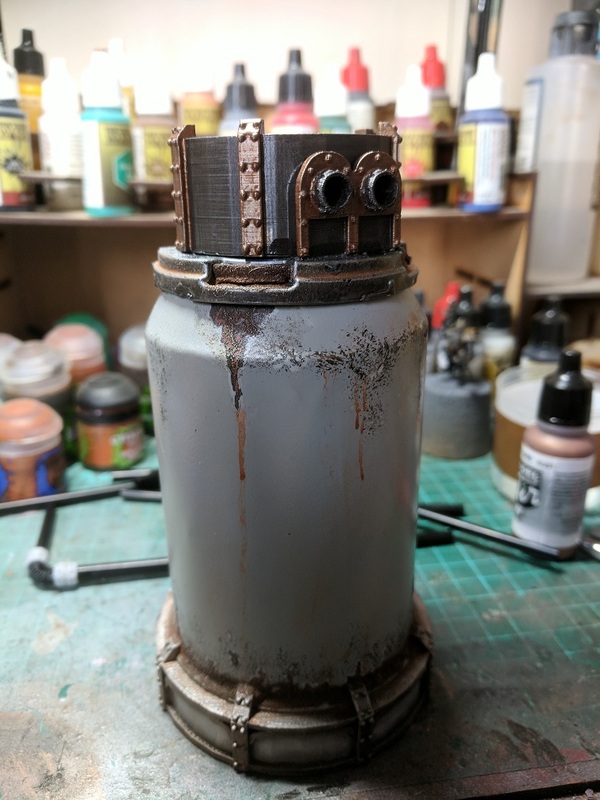 On the picture above the rust paint has been applied to the pipe and the iron powder and glue mix has been applied round the base, after drybrushing with a light silver the texture stands out and gives the same effect as the typhus corrosion technical paint. 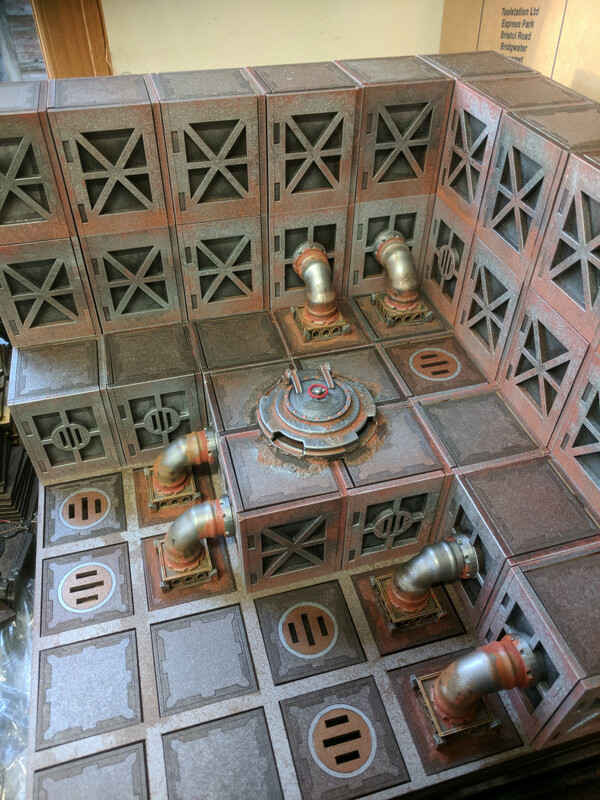 Its a bit... bare, how bout a few throw cushions, a coffee table.... some industrial pipes and built up grime? 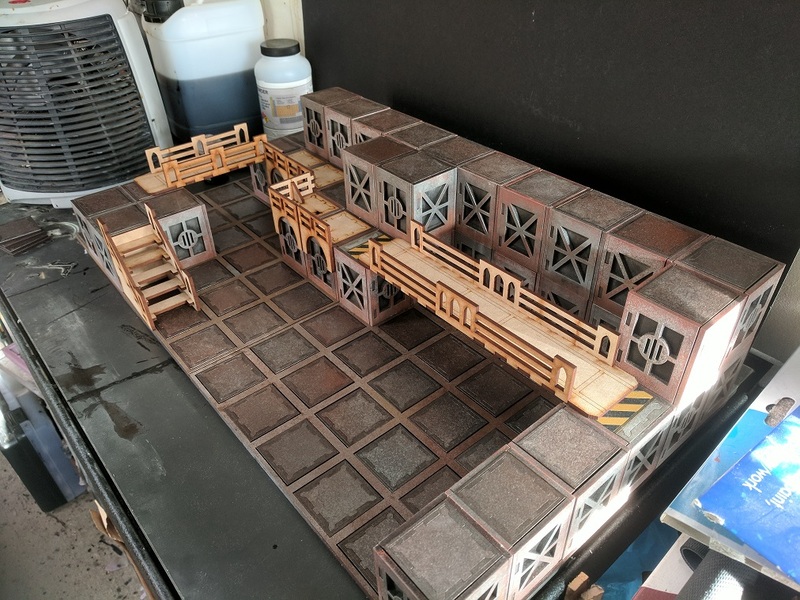 Even with the scenery from the game the base boards and construction cubes by themselves looked a little bare… it’s time to add in some additional scenery. The first thing i wanted to add was some industrial pipes, the kind of thing that could carry water, air… and other things. 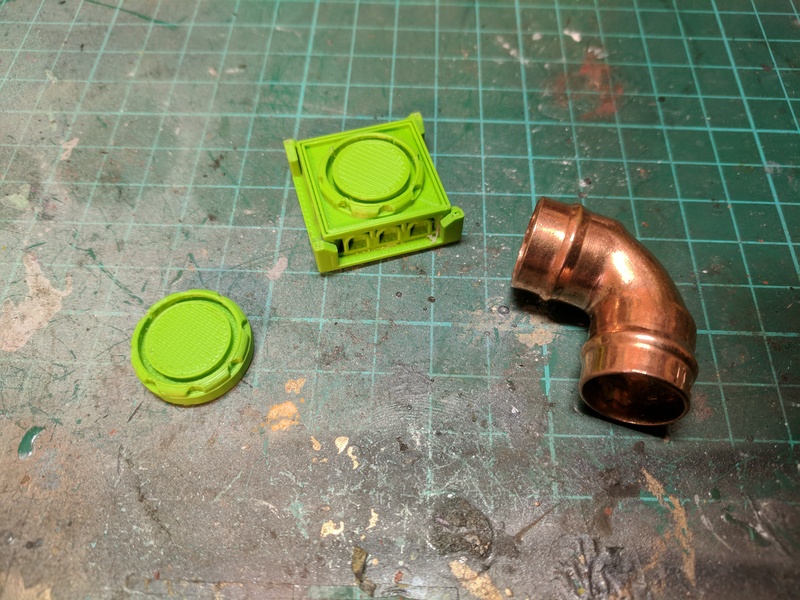 I based my idea around 15mm copper pipe connectors, nothing too fancy just the kind of thing you can pick up from most DIY stores. 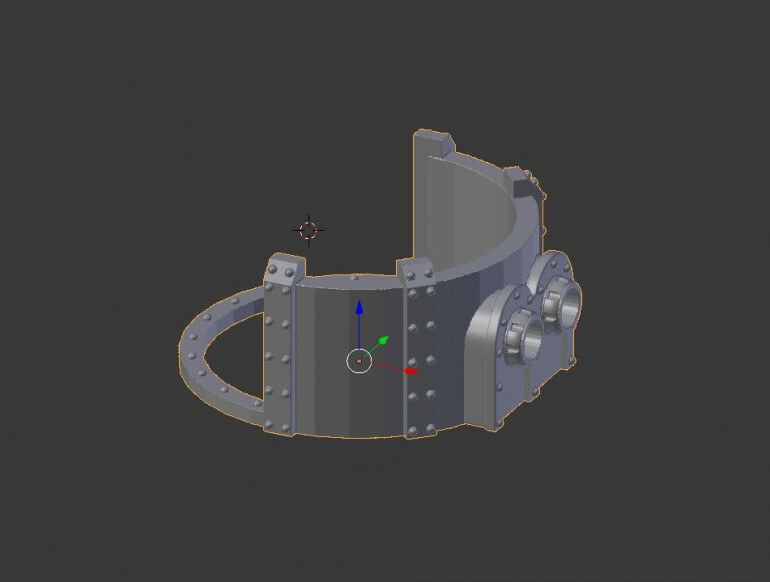 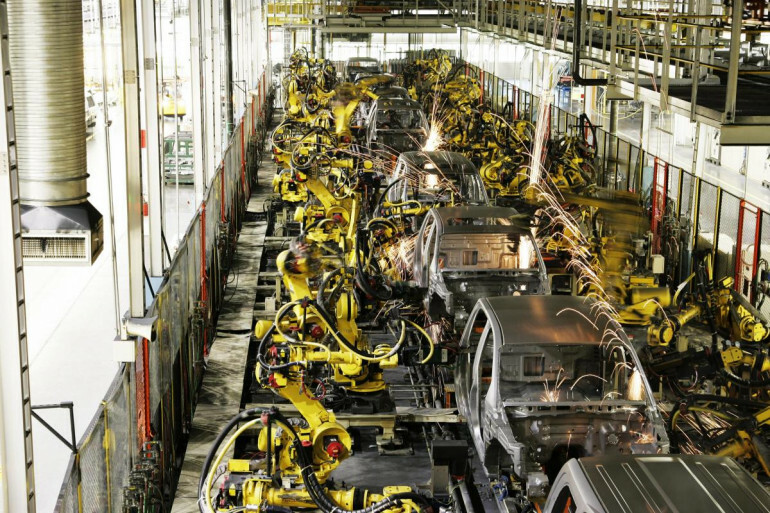 Each pipe would consist of a base block, end cap and a pipe fitting. 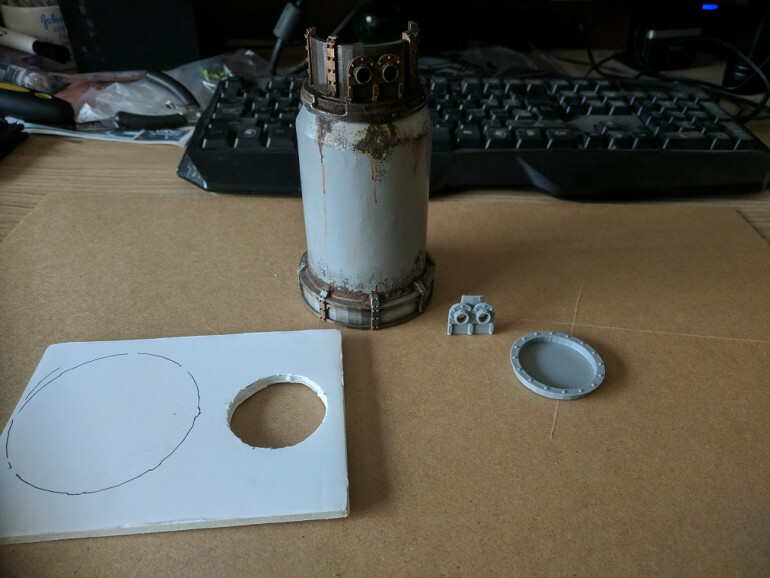 Once i was happy with the dimensions and fitting it was time to glue it together and paint. 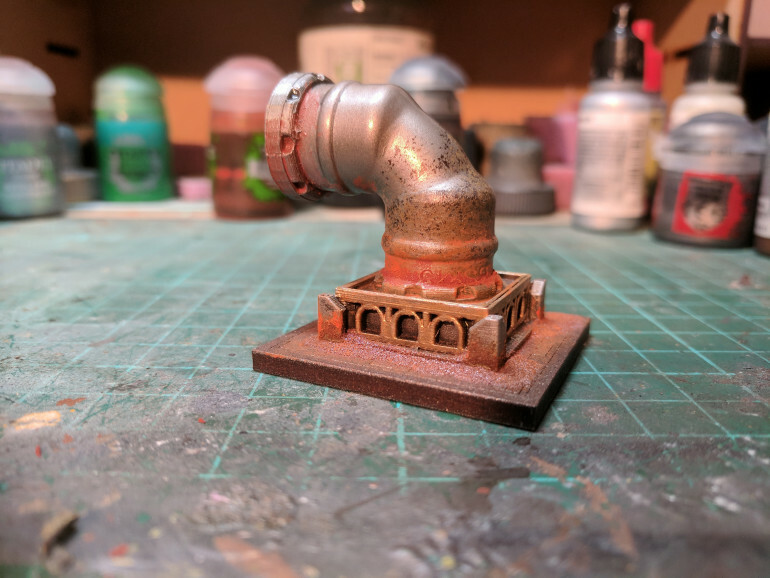 Sprayed the pipe with Lead Belcher, then washed with nuln oil and agrax earthshade (perfect for creating an aged metal look) i added in my own rust mixture (which i will expand on in another entry) and then glued the finished piece to a tile, finally i drybushed a light silver to bring up all the textures. Paint brings life.... the paint must flow. 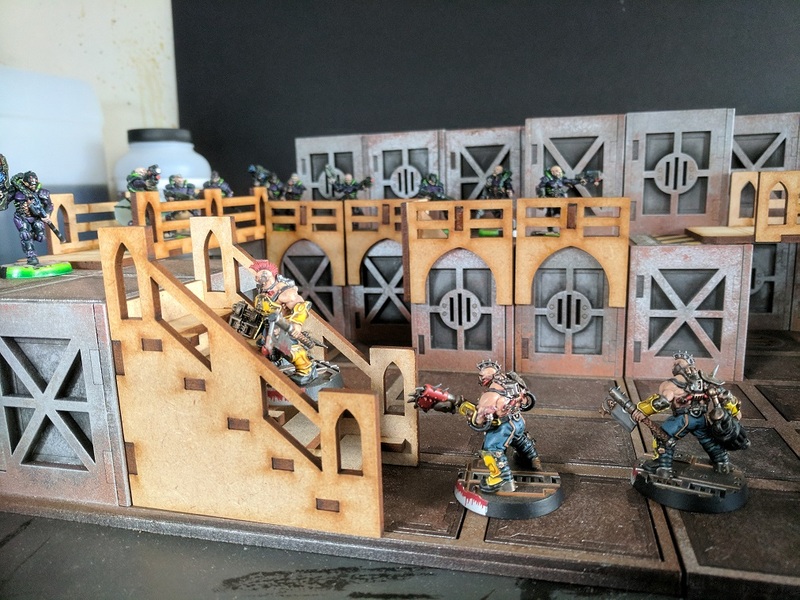 With the test run complete it’s time to add some colour, as much as i love laser cut MDF i doubt it has much of a place in the hive cities of the 41st millennium, the colour scheme needed to be metal, grime, rust and decay but this is just scenery at the end of the day, i didn’t want to spend several weeks painting each cube and square with accurate metal shades and weathering….. so i entered the old “spray can” cheat code. 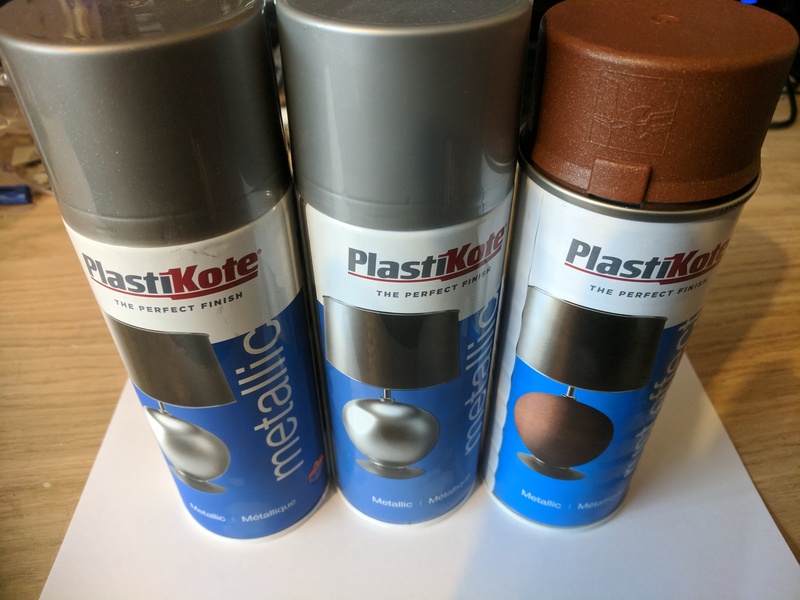 PlastiKote... not the best or worst spray on the market but for £8 a can it certainly does the job, one can of dark metal, one lighter shade and a can of their rusting effect. The tiles we're designed to be moved about so the different paint effects on each add another level of randomisation and of course set up in whatever configuration I wanted. 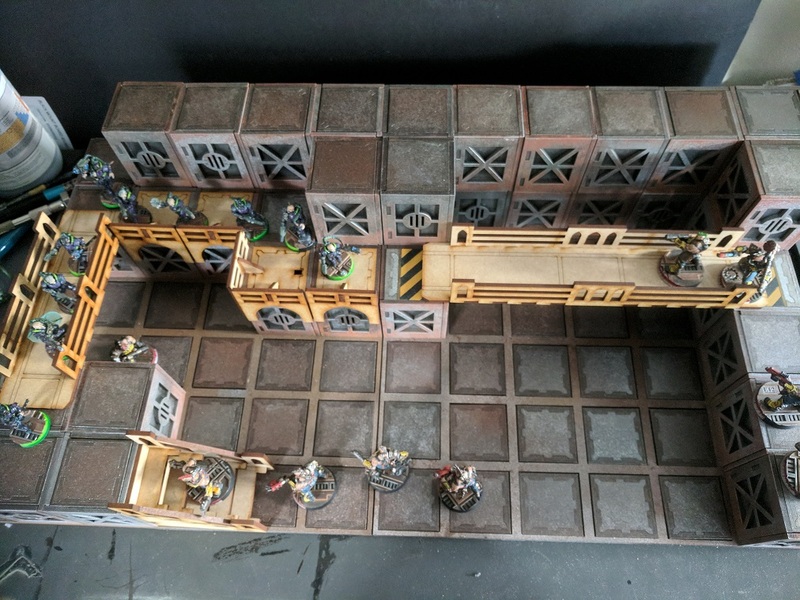 The last part was to paint up the construction cubes, one again nothing fancy, spray painted with the lighter metal colour and the bottom edge sprayed with the rust effect, as a final touch i just sponged on some weathering pigments and paints. 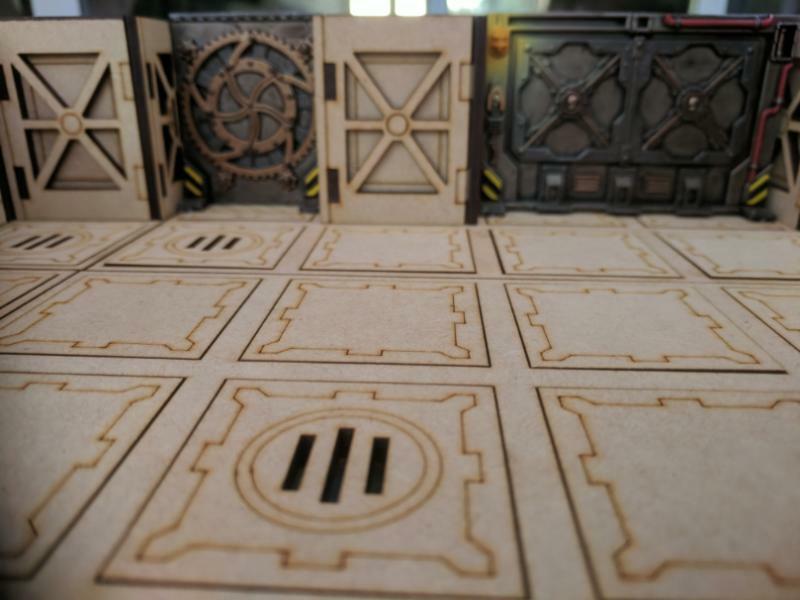 One board section set up complete with doors and scenery for effect. 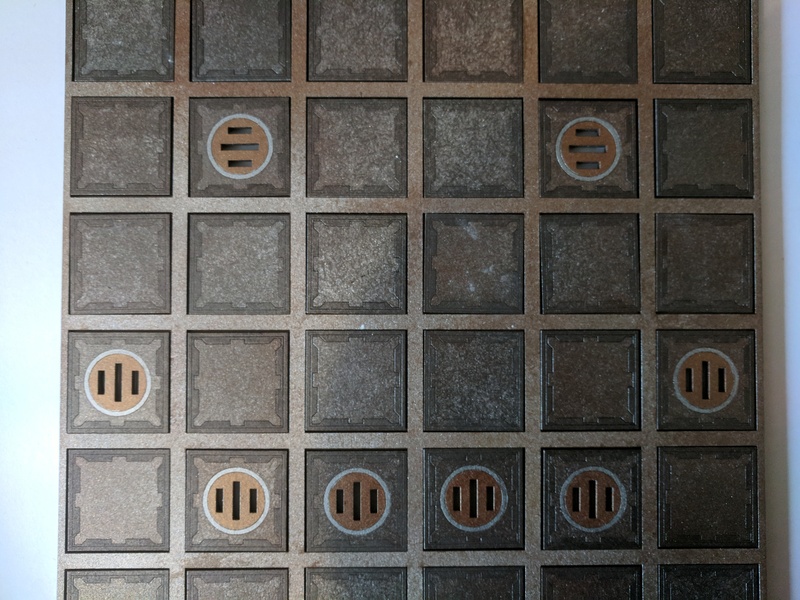 The only way is up...down, left right... wherever. 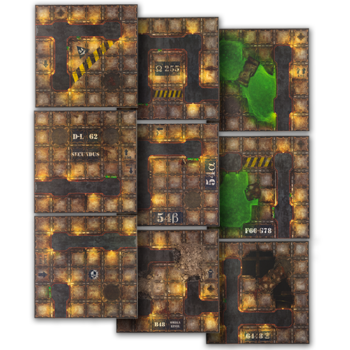 With the boards and construction cubes created it was time to do a test run and see if one of the maps from Necroumnda: Underhive could be replicated with a few additions and changes, I used the scenario "Smash & Grab" as my test run. 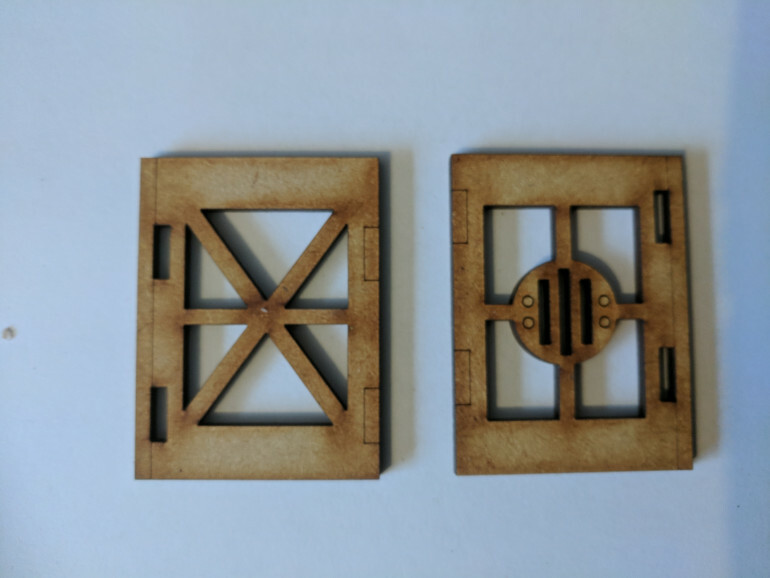 One of the scenery items provided in Necromunda: Underhive is the bulkhead doors, I wanted to make sure this scenery system worked with the scenery already provided so i needed to test the width between cubes to ensure that the doors could be inserted and removed smoothly, luckily they fit perfectly with only a small gap either side. 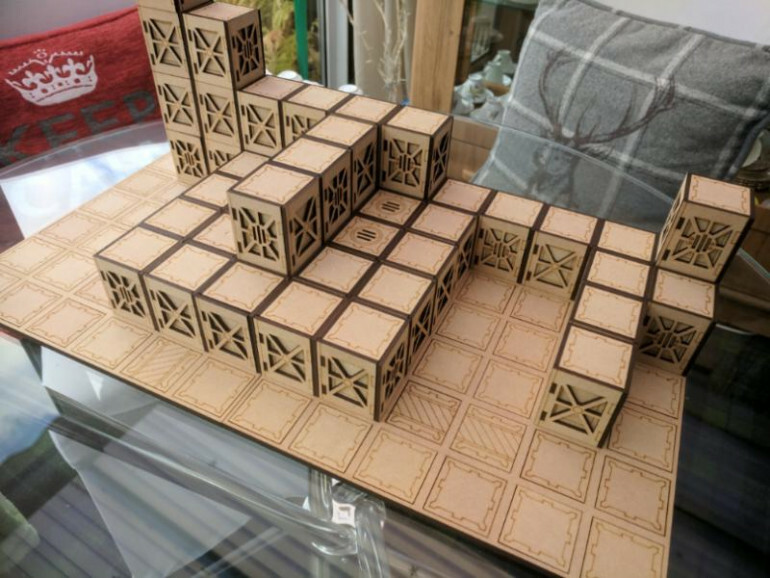 It's Like minecraft only for 40k..
With base boards set up it was time to look at the next big component, the construction cubes. 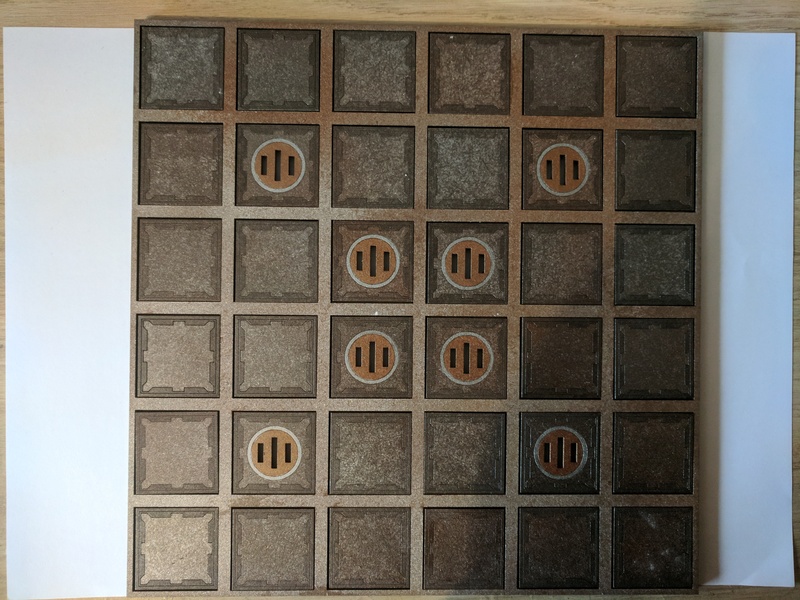 Each cube would consist of an inner layer which would fit into the squares on the base board and be offset around the top to provide a small shelf which one of the floor tiles could be rested on, the outer cladding consists of two designs, one standard bulkhead and the other cut to represent some form of air duct/ventilation shaft. 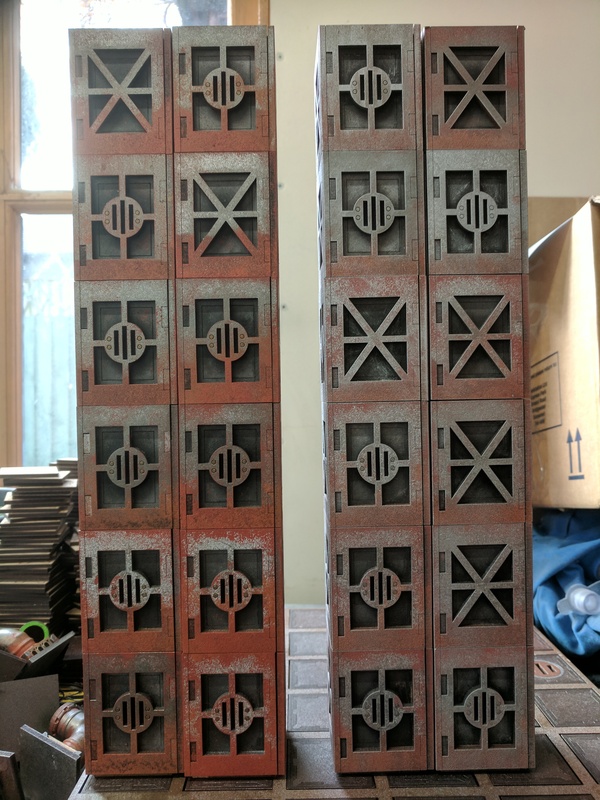 Once assembled these cubes will provide the base structure for walls and upper floors, cubes can be lined up next to each other or on top of each other meaning a board layout can be constructed in a similar fashion to the Minecraft system... 40K-Craft? 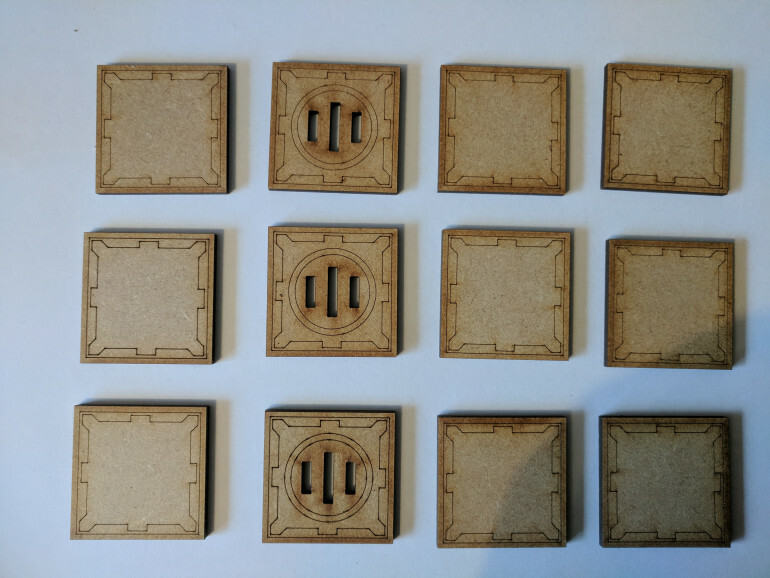 To start things off i needed to know what i was going to work with, since the underhive box set came with a selection of pre-printed board tiles i decided that it would be best to use them as my starting point. Luckily for me boards were already divided into quadrants 6 squares wide and 6 squares long. 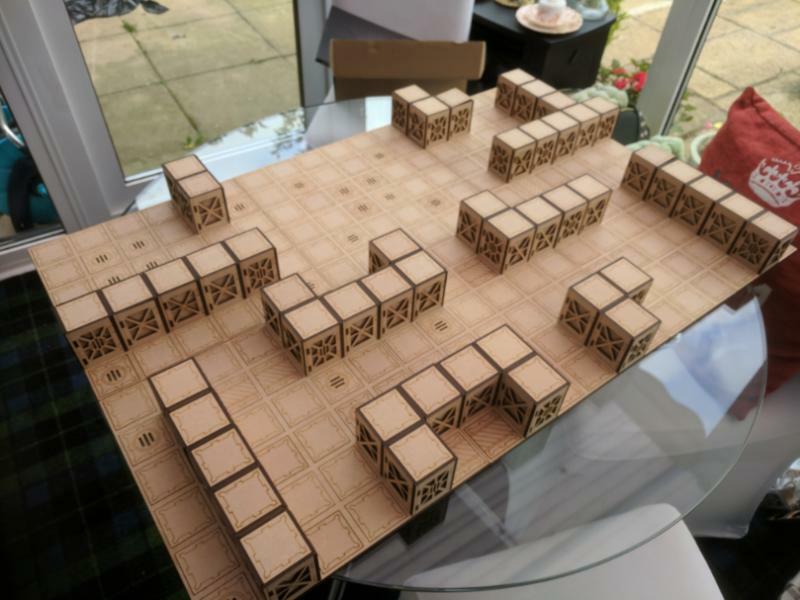 Using these dimensions I drafted up an idea, 2 square MDF boards, the upper layer being a grid with 36 holes and the lower layer being a standard flat board for everything to rest on and provide stability. 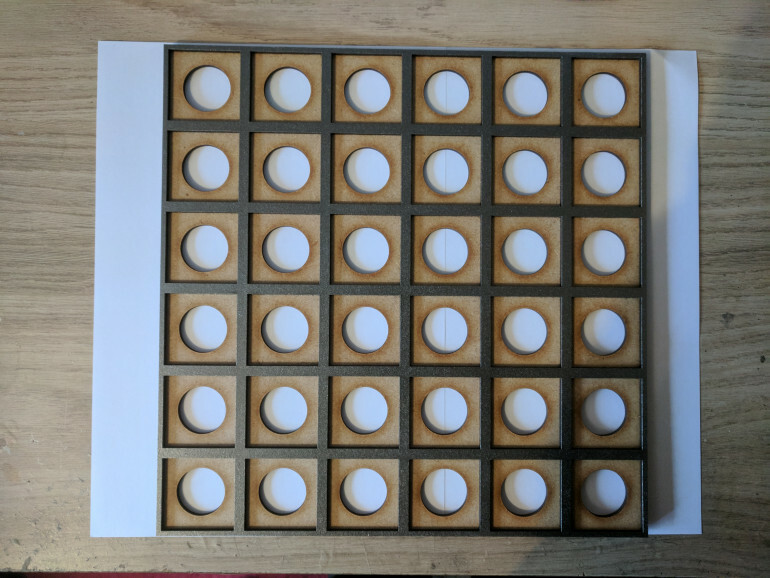 The initial board, the starting point for the rest of this project. The last piece of the board would be the tiles, using the cut-outs from the upper layer each of the 36 tiles were engraved with a border or a drain to break up the flat areas and to make them a bit more interesting to look at.